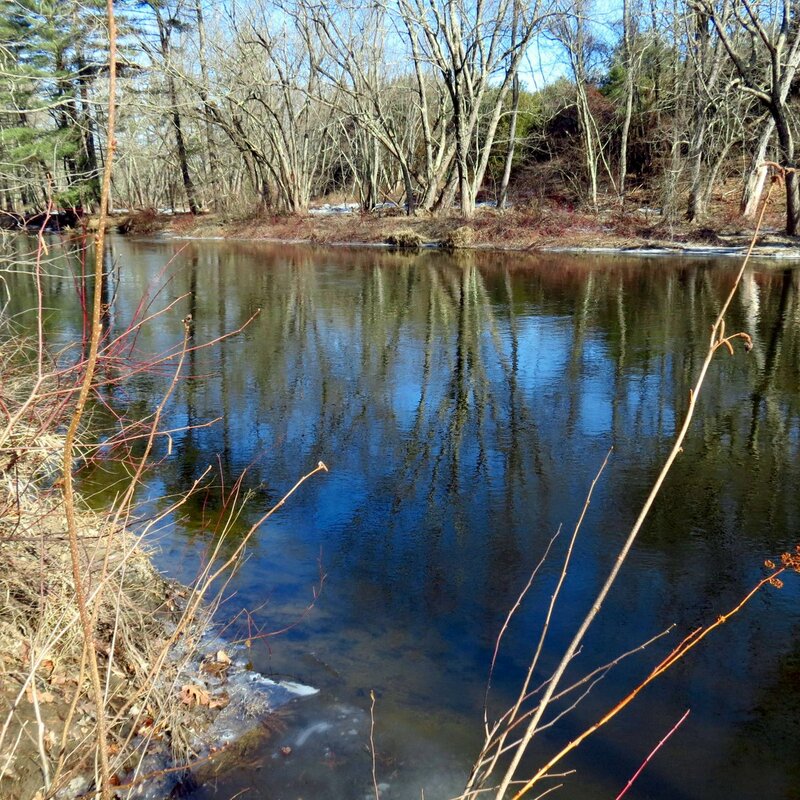 I visited the otter pond recently, trying to figure out how he would come and go. 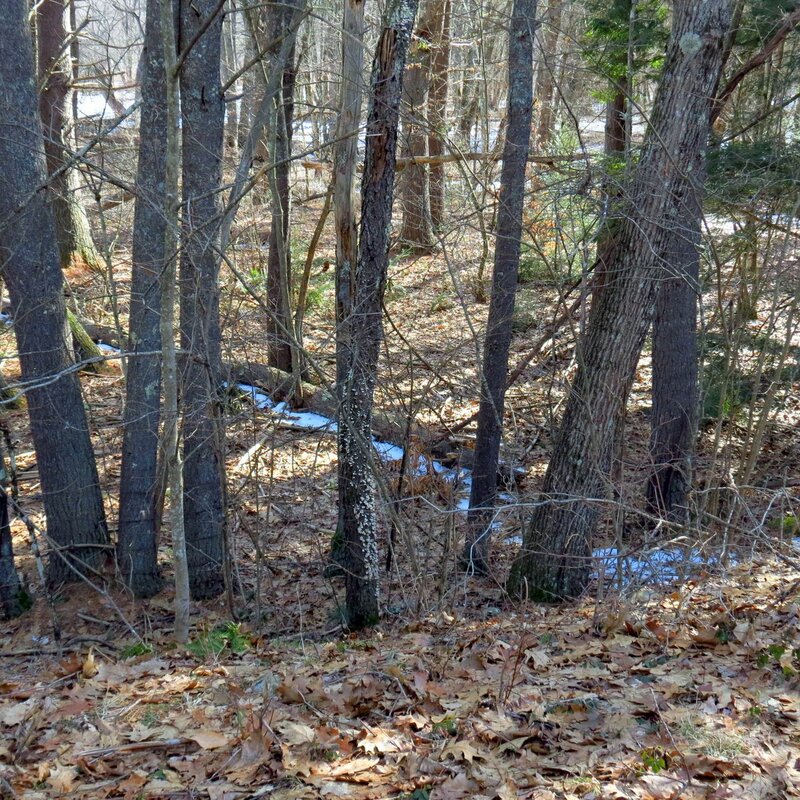 This small stream feeds into the pond but it’s too shallow and narrow for an otter to swim in. 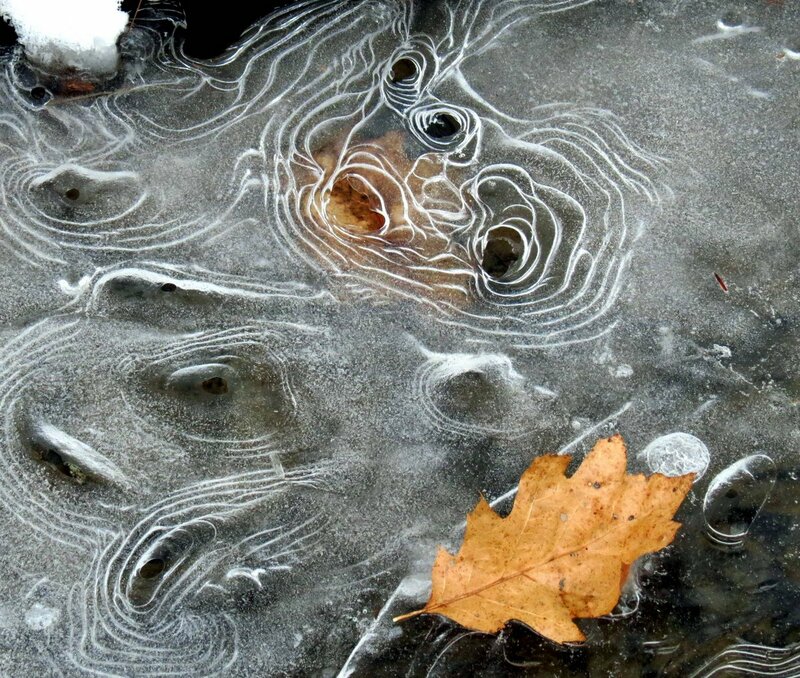 It had some beautiful patterns in its ice though. 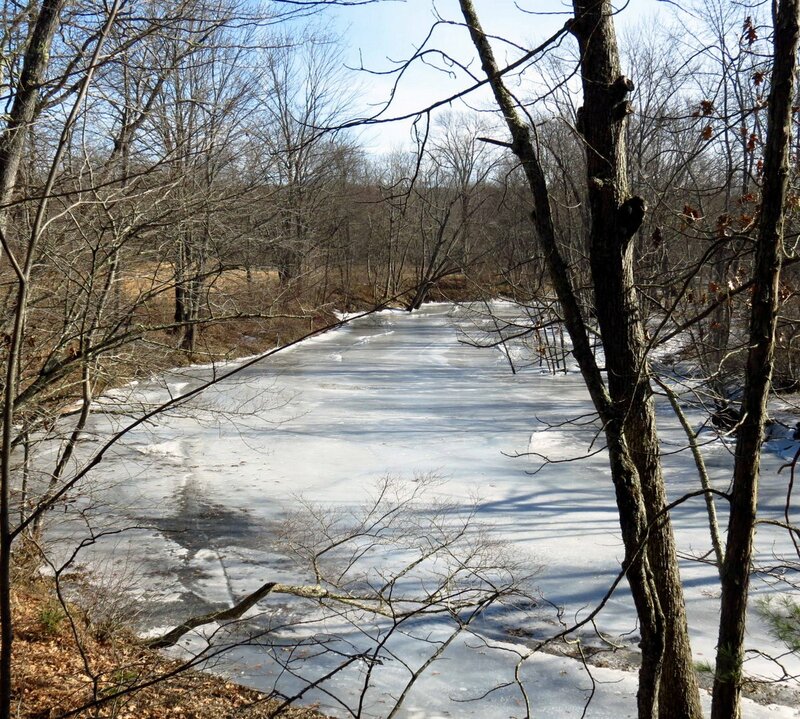 The reason I wondered about the otter is because its pond is completely frozen over with no holes like there were the last time I saw it in December. Where do otters go when this happens, I wonder? 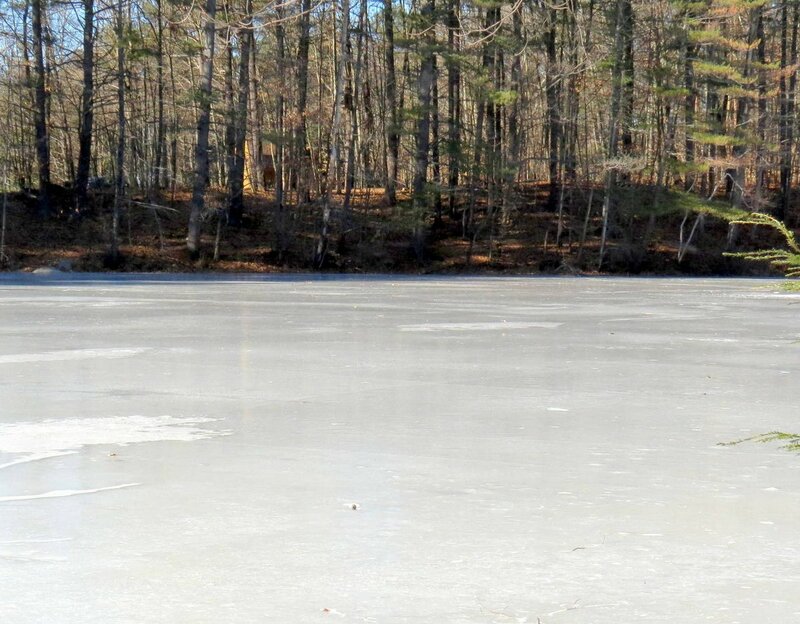 All of the thawing and re-freezing has left the ice as smooth as glass, but the warm weather has made it too thin to skate on. 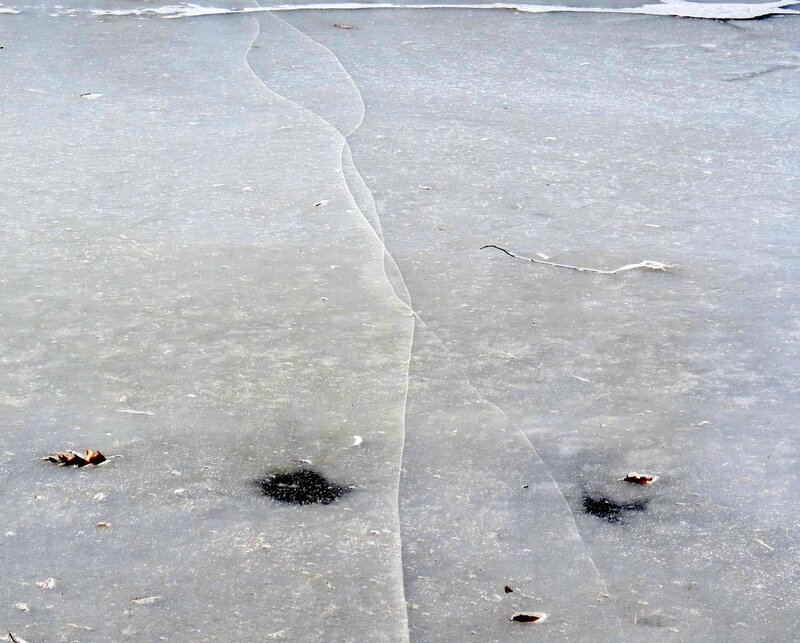 The two dark spots show little to no thickness and there were thin ice signs where people skate. 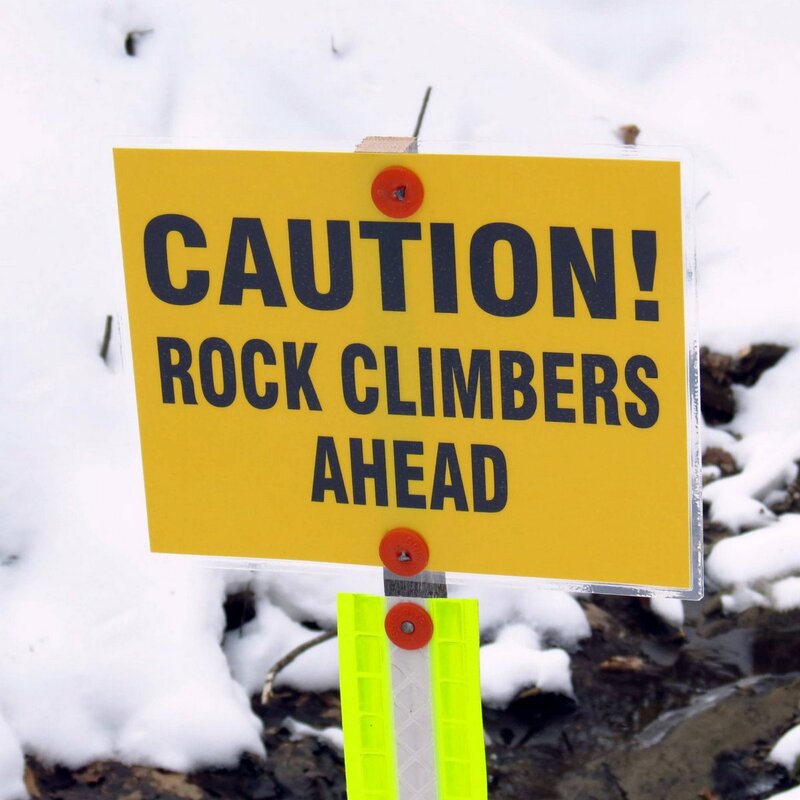 I’m sure there are a few dozen frustrated skaters it town because of it. 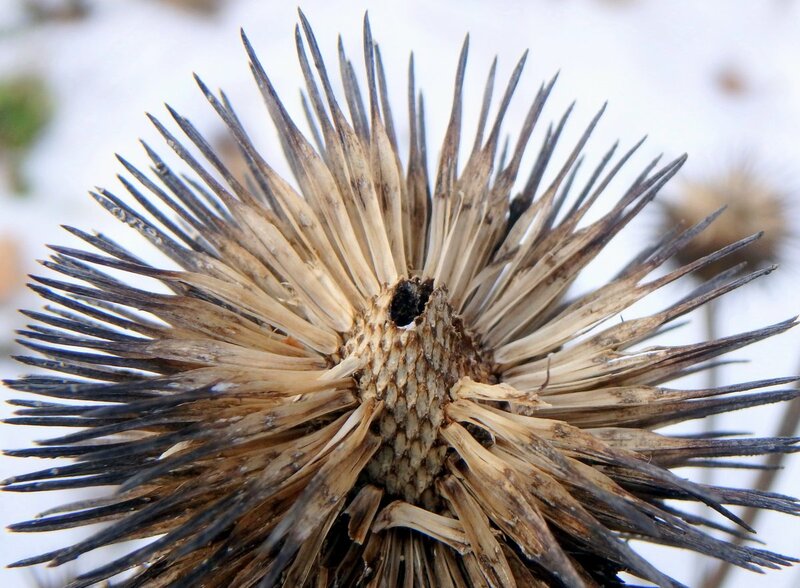 I saw some burdocks and remembered how Swiss engineer George de Mestral got the idea for Velcro from the sticky burrs lodged in his dog’s coat. I wondered why I didn’t think of such things. This is where the hook part of the “hook and loop” Velcro fasteners came from. I’ve never seen it happen but I’ve heard that small birds can get caught in burdocks and then can’t escape. That could be why there were no seeds missing from these examples; maybe the birds have learned to stay away. 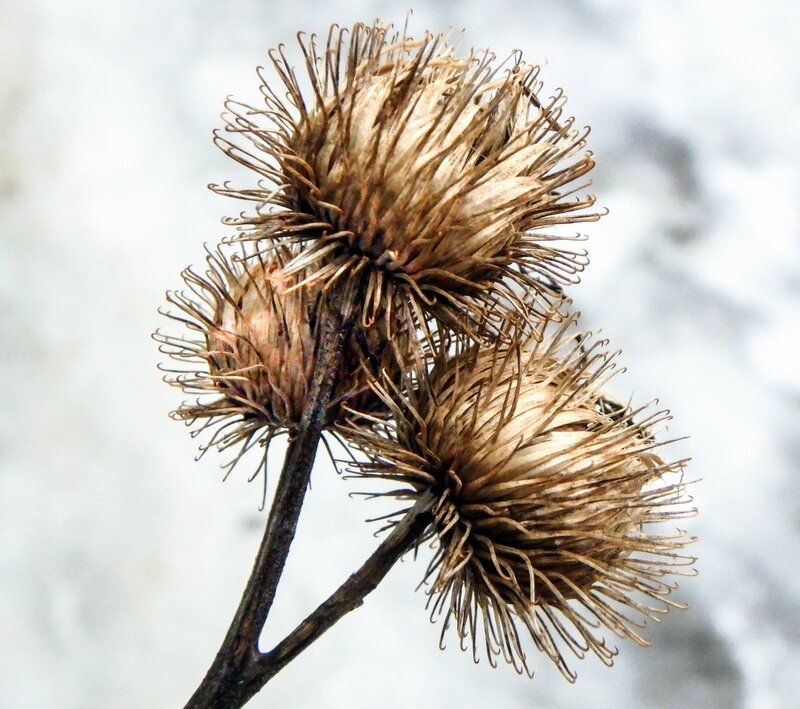 According to John Josselyn, a visitor from England in 1672, the burdock came to this country as burrs tangled in cow’s tails, but if that is true then how did Native Americans know the plant so well? 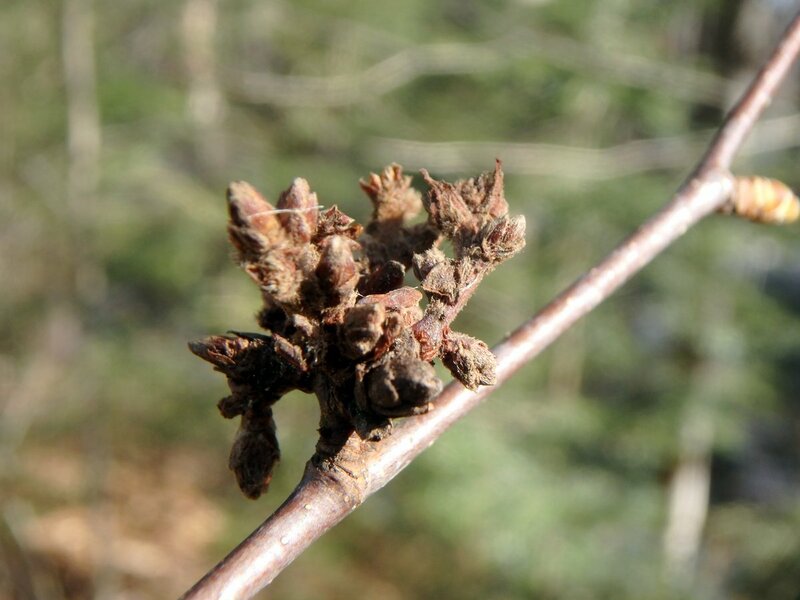 They used the entire plant as food or medicine and made a candy-like treat from burdock roots by slicing them and boiling them in maple syrup. 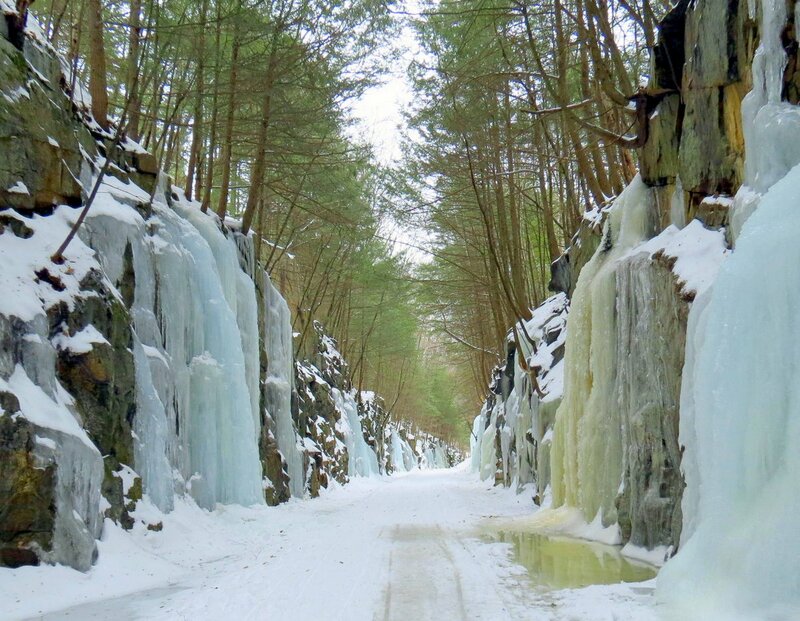 They stored much of it for winter. Birds aren’t staying away from coneflower seeds. 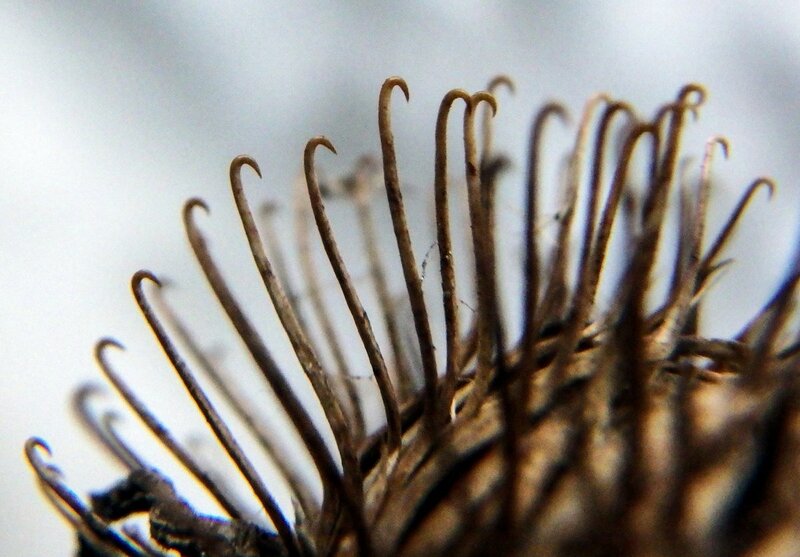 I always let coneflowers (Echinacea purpurea) go to seed. Goldfinches, cardinal, blue jays and other birds love to eat them. I’ve never seen a bird on them but the seeds disappear and there is often a pair of blue jays in the yard. Many butterflies and bees also love its flowers, so if you’re looking to attract the birds and bees, this is one plant that will do it. The Echinacea part of the scientific name comes from the Greek word echinos, which means hedgehog, and refers to the spiny seed head. 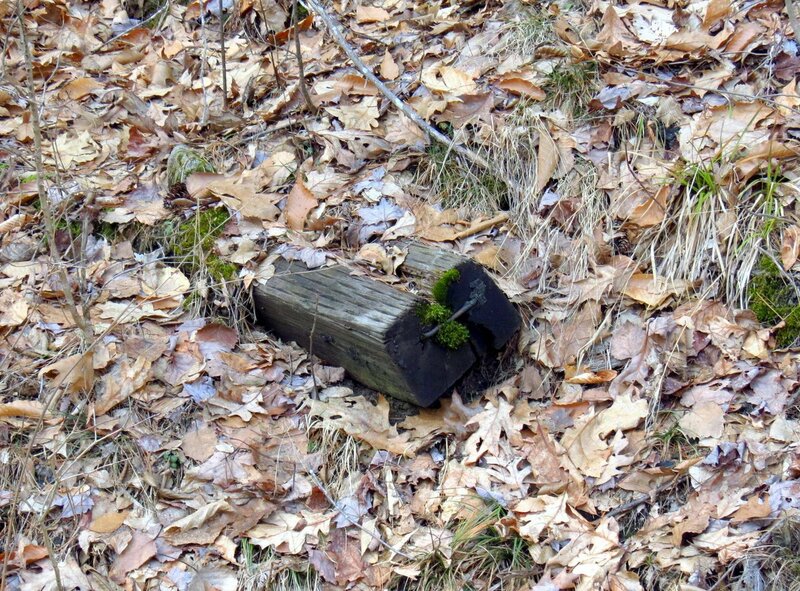 An old pine stump was red with British soldier lichens (Cladonia cristatella.) 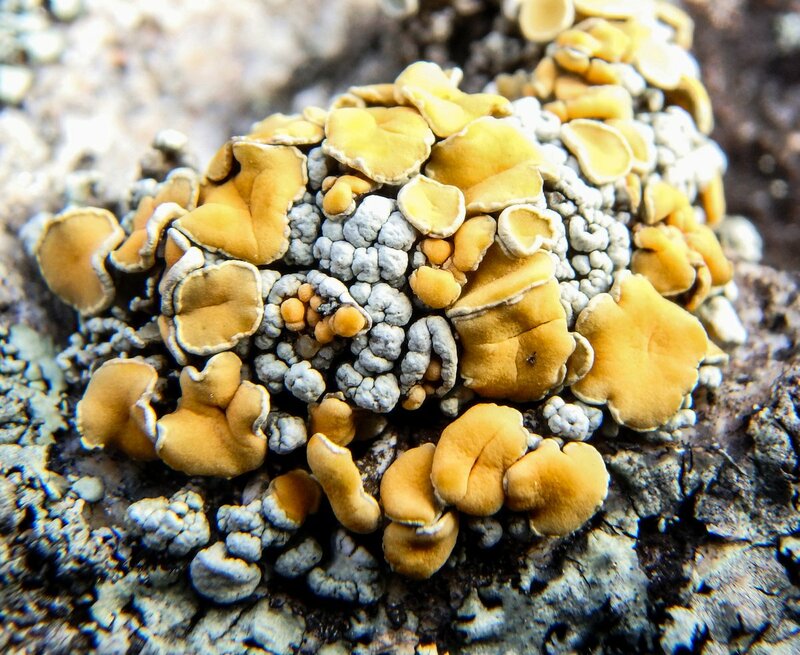 This lichen also grows on bark or soil and is often seen where people live because it is extremely tolerant of pollution. 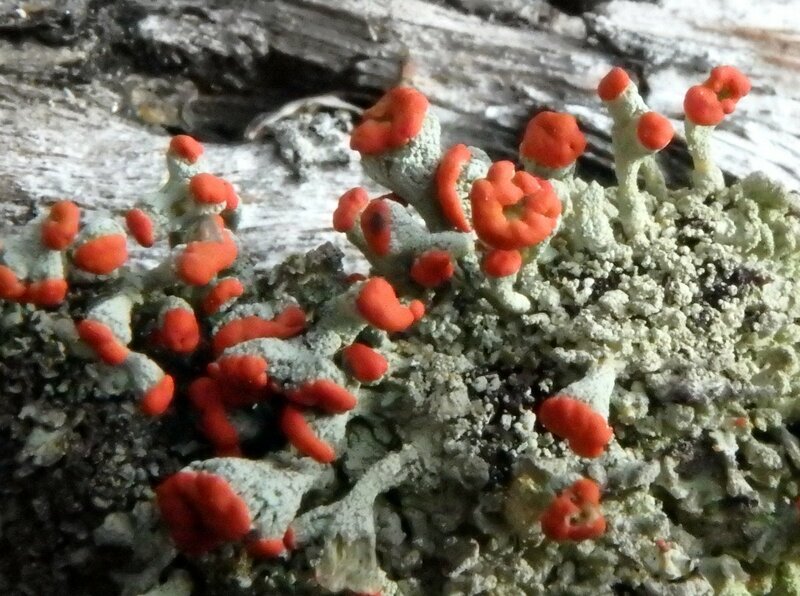 Because of that and its bright red color it is said to be the best known lichen in the eastern United States. I’ve even seen it growing on buildings. 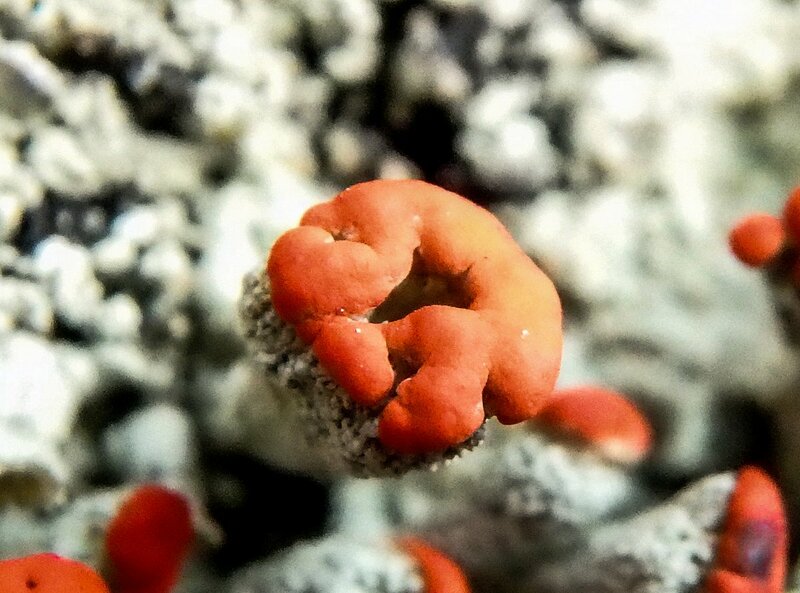 The spore bearing apothecia of the British Soldier is very red with a matte rather than shiny surface. The biggest among this grouping could have easily hidden under a pea. 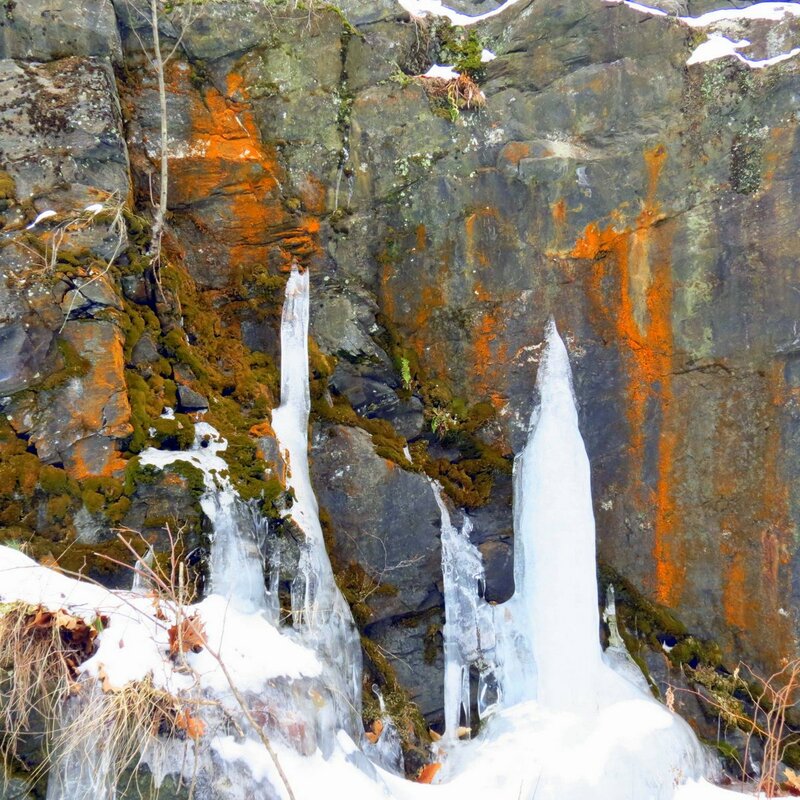 If you spend time walking along stone walls eventually you’ll see a stone with a splash of bright orange on it. 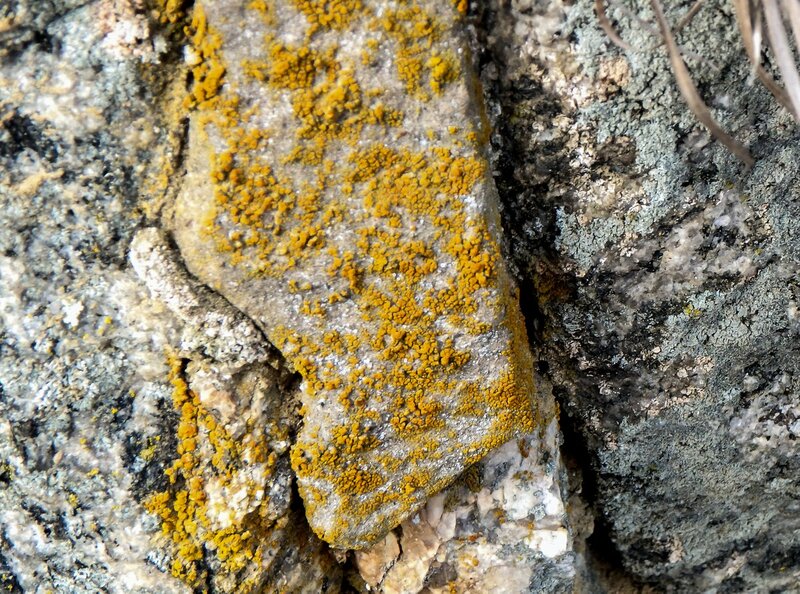 This is the sidewalk firedot lichen (Caloplaca feracissima,) so called because it is a lime lover and grows on concrete sidewalks, which have lime in them. 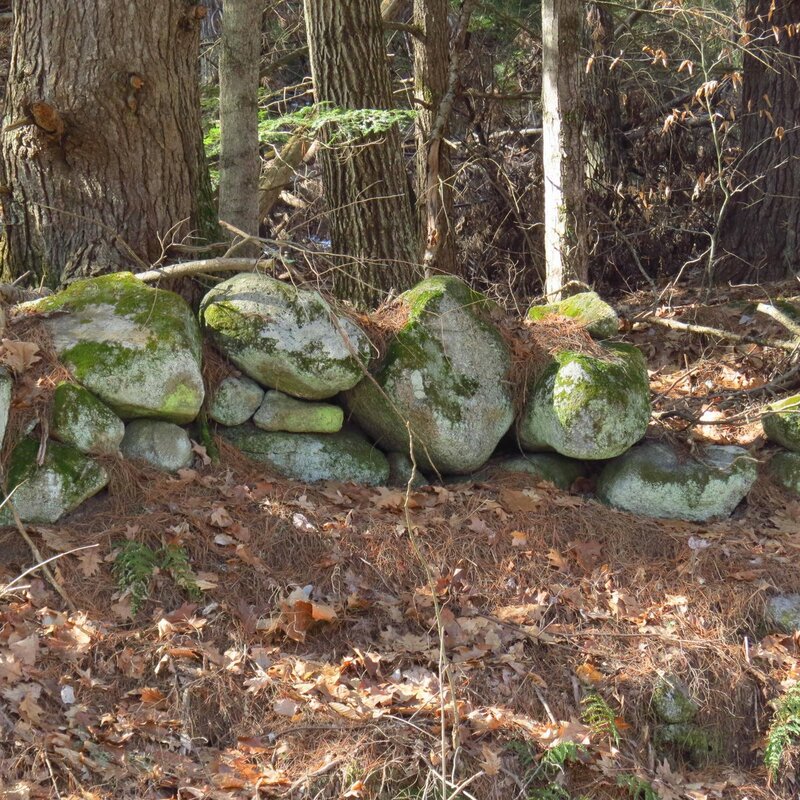 When you see it in a stone wall it’s a fair bet that the stone it grows on has limestone in it. A closer look at this example of the sidewalk firedot lichen showed it was made up of mostly irregularly shaped fruiting bodies, so it was making plenty of spores. I think this is the first time I’ve seen it do so. I had to visit my old friend the scattered rock posy lichen (Rhizoplaca subdiscrepans) that I’ve been watching grow for several years now. It has gone from penny to quarter size (0.75-0.95 in) and is both beautiful and unusual with its brain like body (Thallus) and orange fruiting discs (Apothecia.) I always find them growing on stone in full sun. 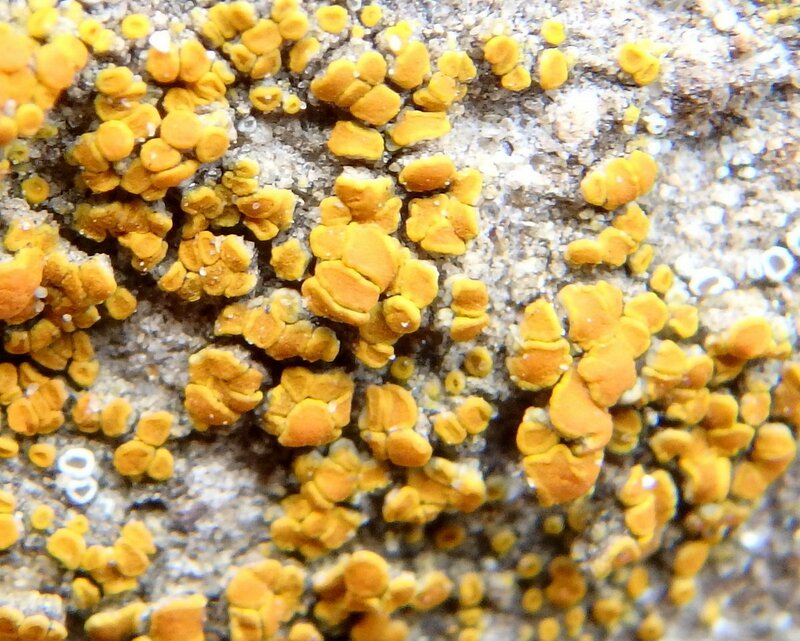 This is a lichen that never seems to stop producing spores; its orange pad like apothecia are always there. 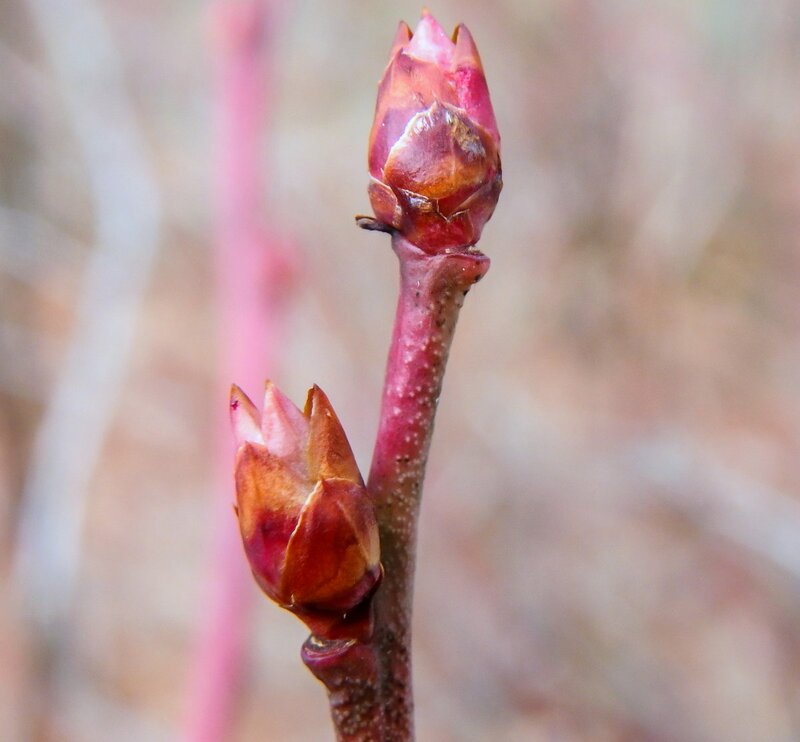 If you’re stuck in the winter doldrums and feel the need for some color, just find a blueberry bush; everything about them is red, except the berries. 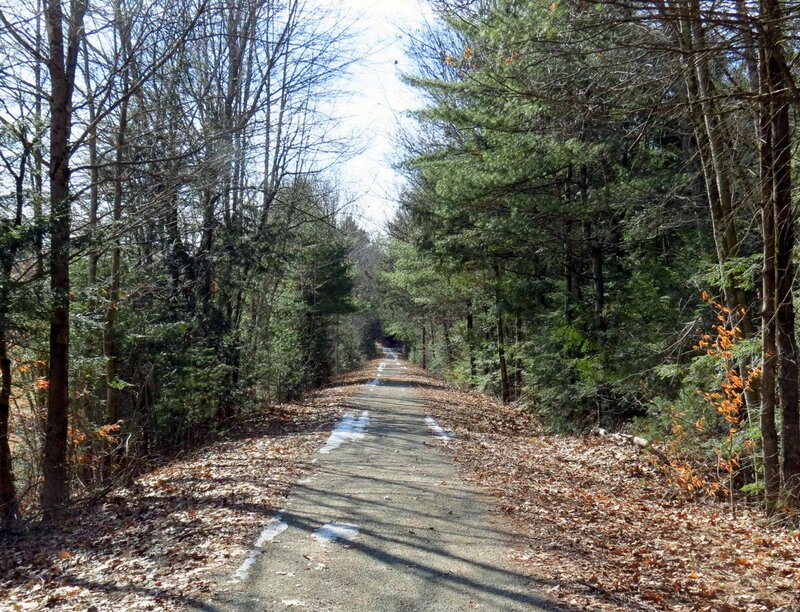 Part of the reason the earliest English settlers survived New England winters in Plymouth was because the Native Americans of the Wampanoag tribe showed them how to dry blueberries for winter use. 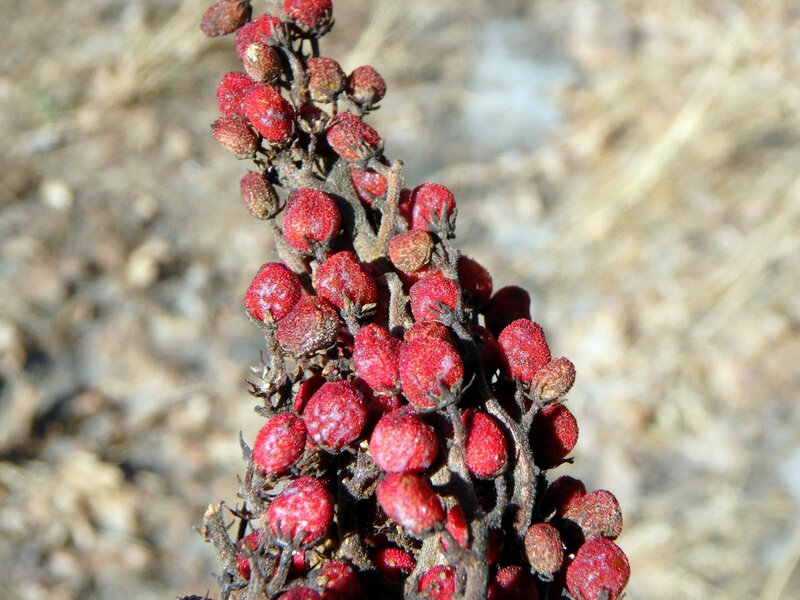 Natives used the dried berries in soups and stews and as a rub for meat. They also made tea from the dried leaves. 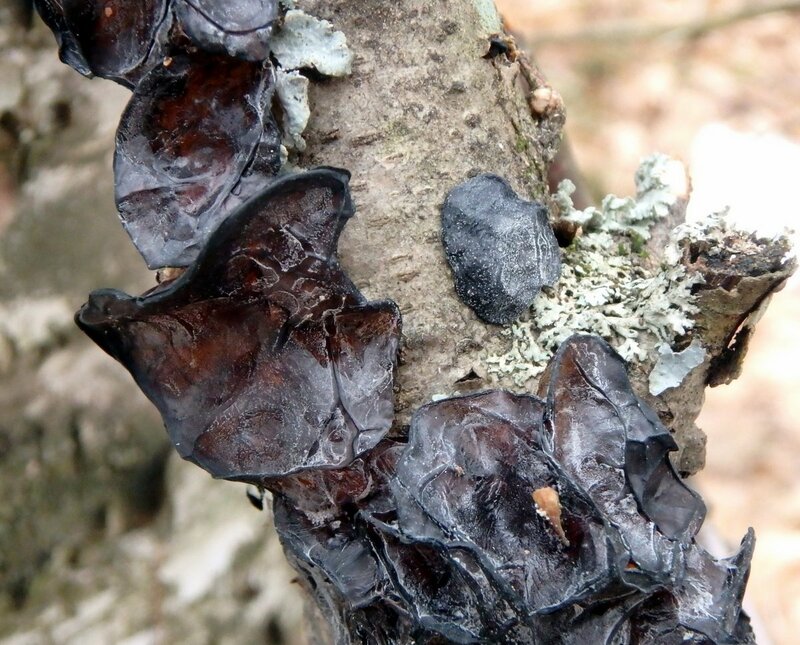 More than 35 species of blueberries are native to the U.S.
Amber jelly fungi (Exidia recisa) have started to appear on downed trees and limbs. You can’t tell from this photo because these examples were frozen solid but this fungus has a shiny side and a matte finish side. The spores are produced on the shiny side and if I understand what I’ve read correctly, this is true of most jelly fungi. This one has the color of jellied cranberry sauce. 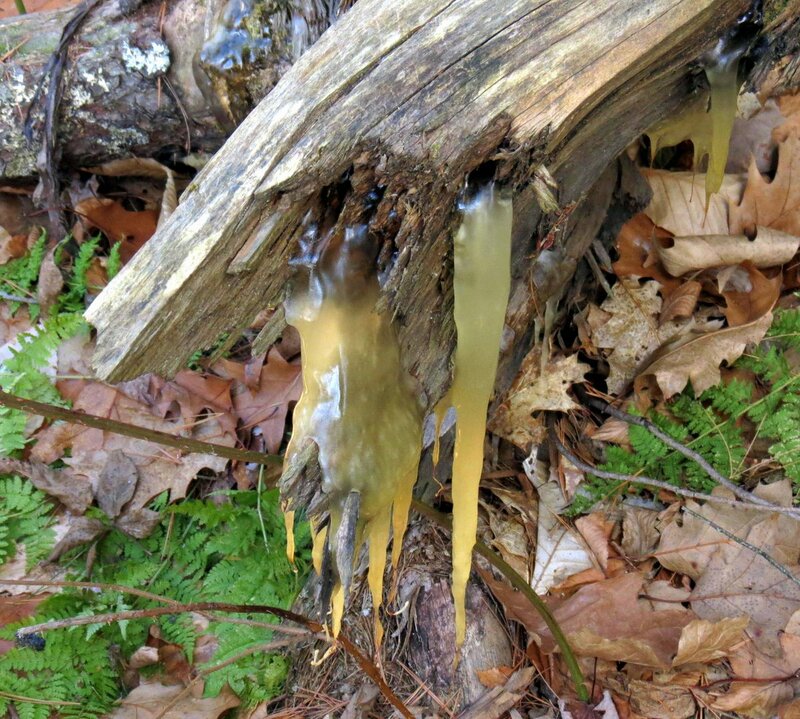 Jelly fungi can absorb up to 60 times their weight in water, so if a weakened branch is covered with them as this oak limb was, it doesn’t take much of a wind to bring the heavily weighted branch and the jelly fungi to the ground. 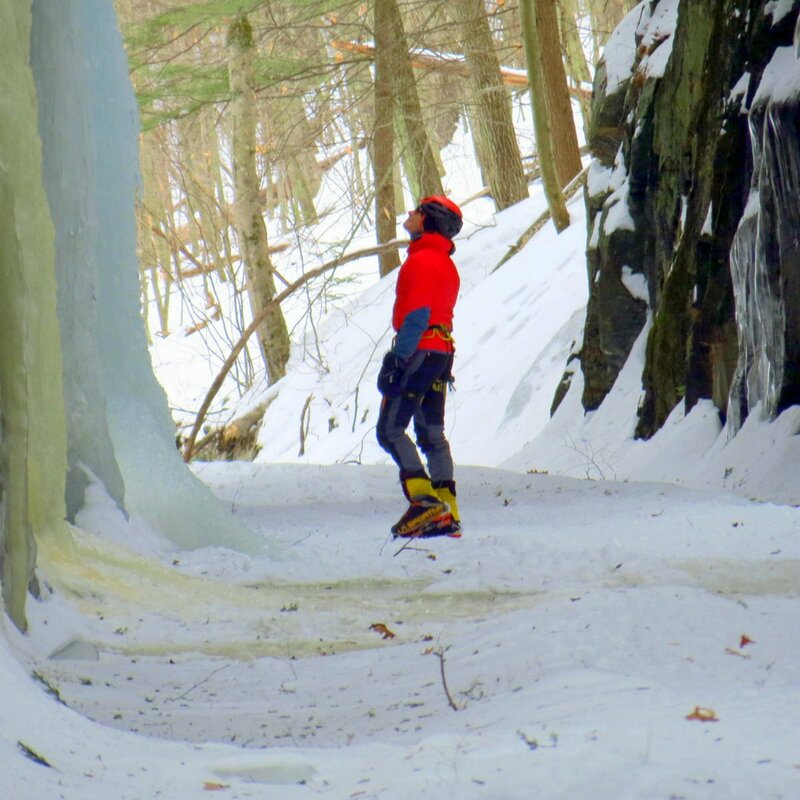 Jelly fungi are a signal that the tree’s health isn’t good. Indian pipe (Monotropa uniflora) seed pods look like beautiful carved wooden flowers that have been stuck into the snow. 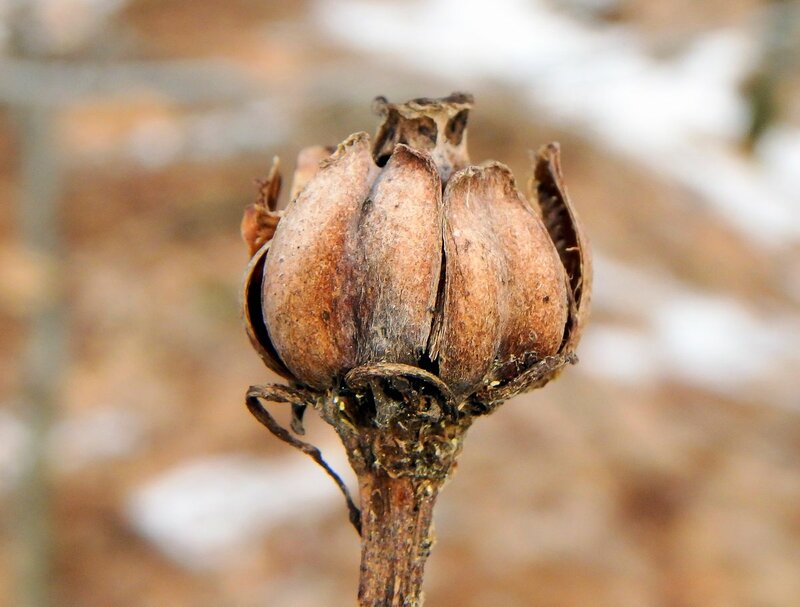 Most have split open by now into 5 separate parts to release tens of thousands of seeds to the wind. 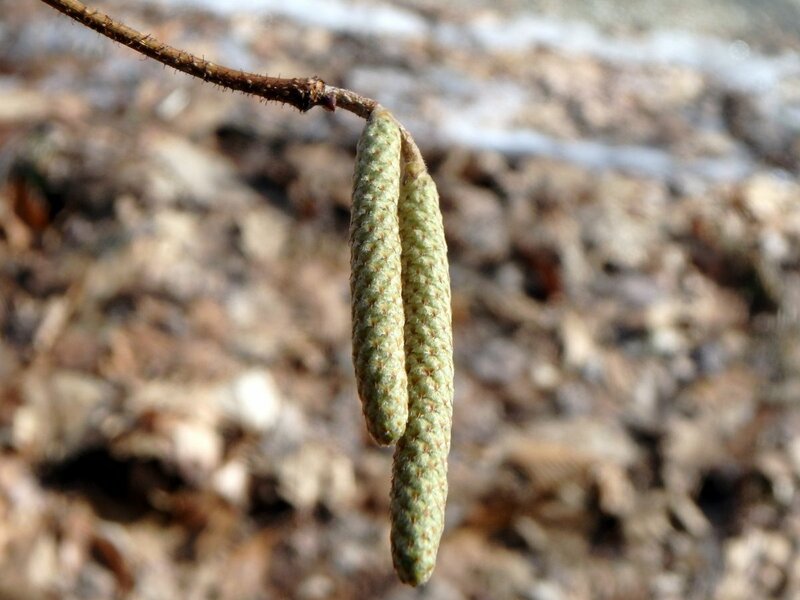 Each individual seed is only ten cells thick. 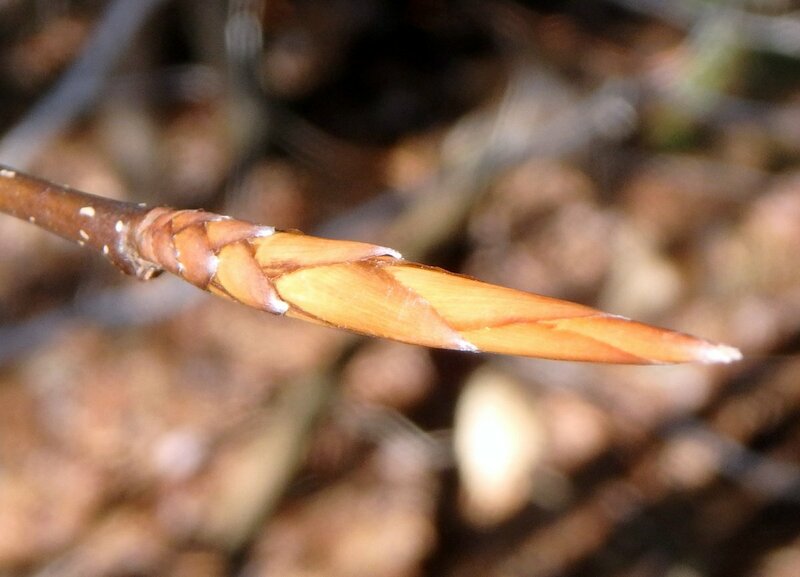 Indian pipes are parasitic on certain fungi, which in turn are often parasitic on the roots of trees so in a roundabout way they get their food from trees. Tinder polypores (Fomes fomentarius), also called horse hoof fungus, grew on a fallen log, but didn’t grow on the tree while it was standing. I know this because their spore bearing surfaces pointed towards the ground. 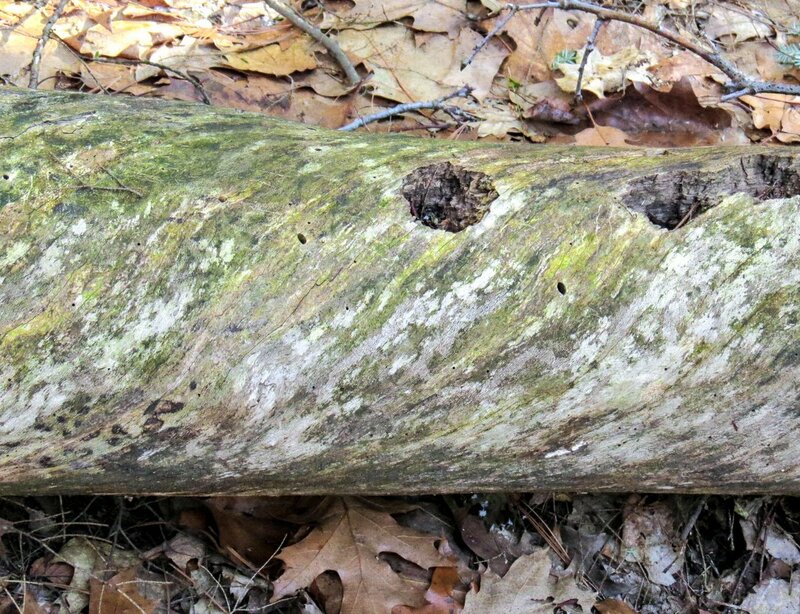 If they had grown before the tree fell then their spore bearing surfaces would appear perpendicular rather than parallel to the ground. 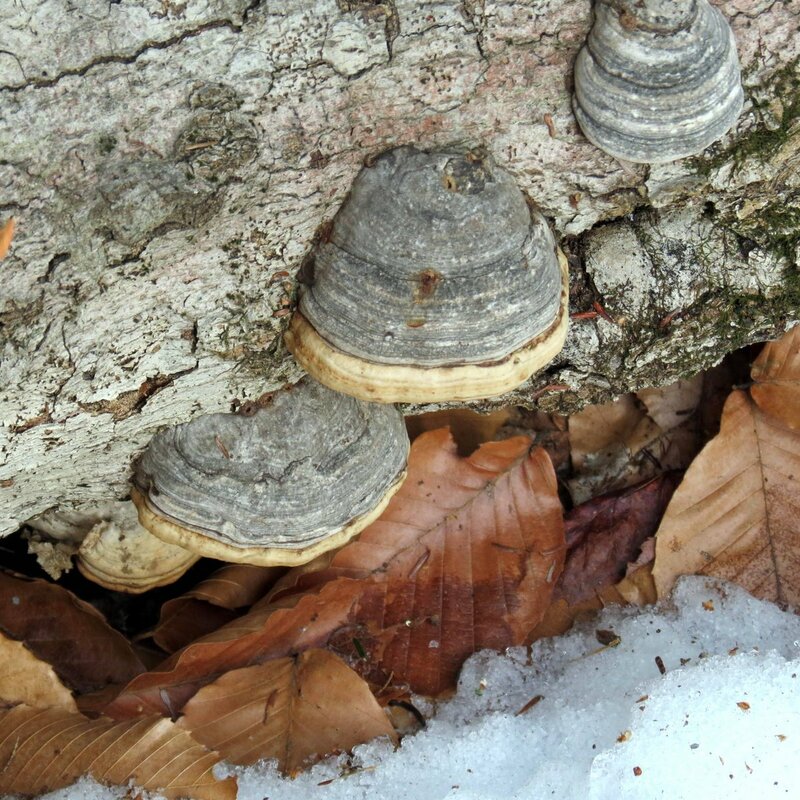 This bracket fungus produces spores at all times of year but through spring and summer studies have shown that as many as 800 million can be produced in a single hour. The fungus is also known for its ability to stop bleeding and was recommended for that purpose by none other than the father of medicine himself, Hippocrates (460 – 370 BCE). I’ve searched and searched for the answer to why some trees twist when they grow and the short answer seems to be; nobody really knows. 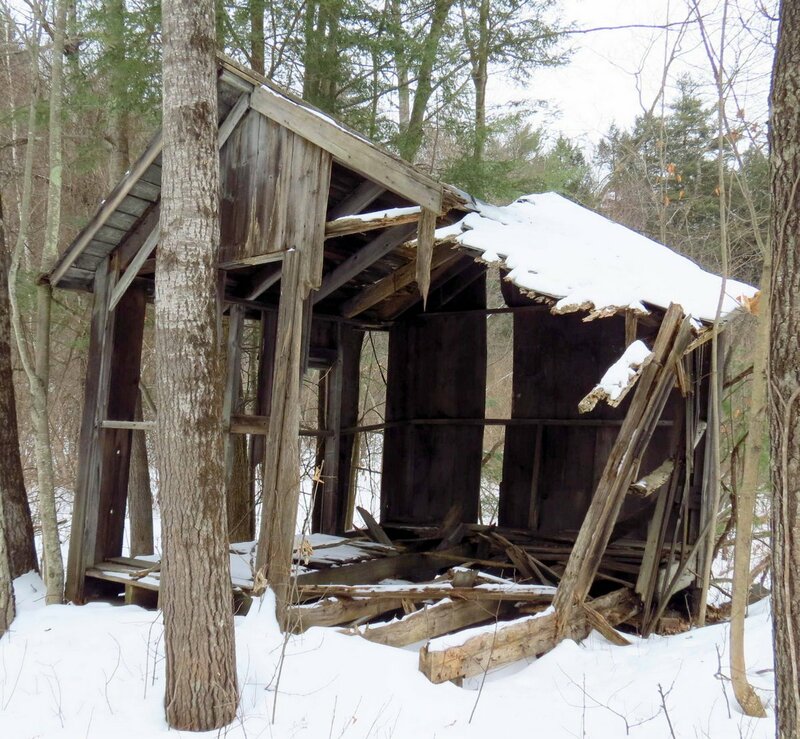 What is known is that the wood is often weaker and boards cut from spiral grained trees often twist as they dry, yet while the tree is standing it is more limber than a straight grained tree and is better able to withstand high winds. Scientists have also found that spiral growth can be left or right handed and both can sometimes appear on the same tree. 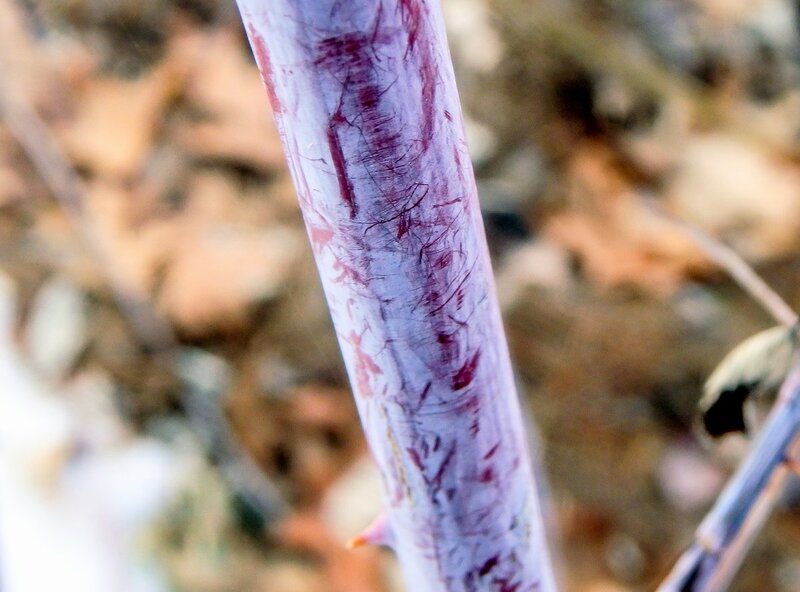 Though spiral growth appears in the trunk, limbs and roots of some trees you often can’t see it until the bark comes off. 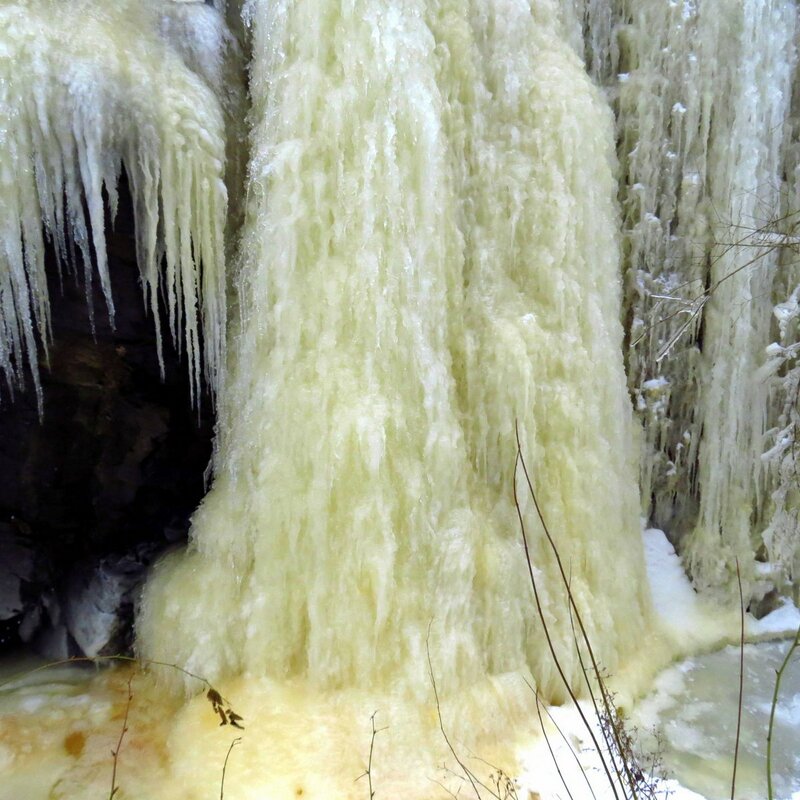 It’s easy to believe that a fallen tree is just an old dead thing that is slowly rotting away but as the icicles on this example show, there is life in it yet. 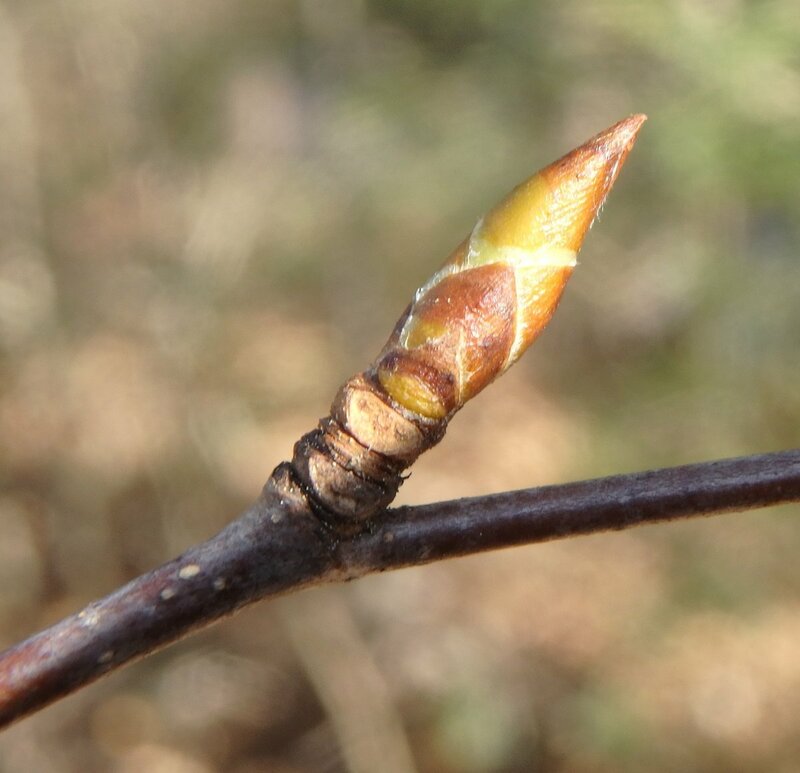 It’s always a pleasure to see the beautiful blue of first year black raspberry canes in winter. The color is caused by a powdery wax which can protect the plant from sunburn, prevent moisture loss, or help shed excess water. 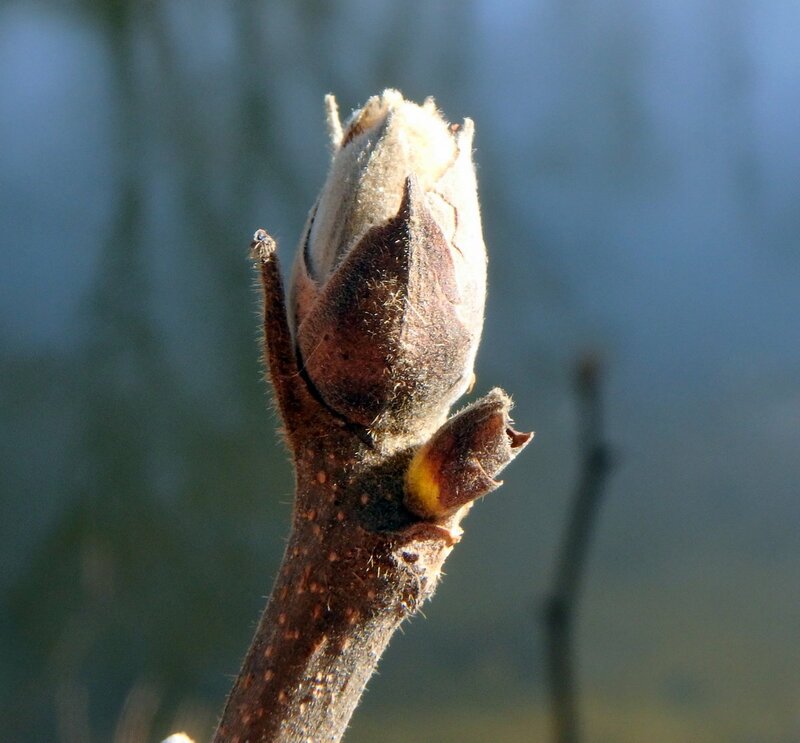 In botanical terms, a plant part that looks like this is said to be glaucous, which describes the whitish blue color. 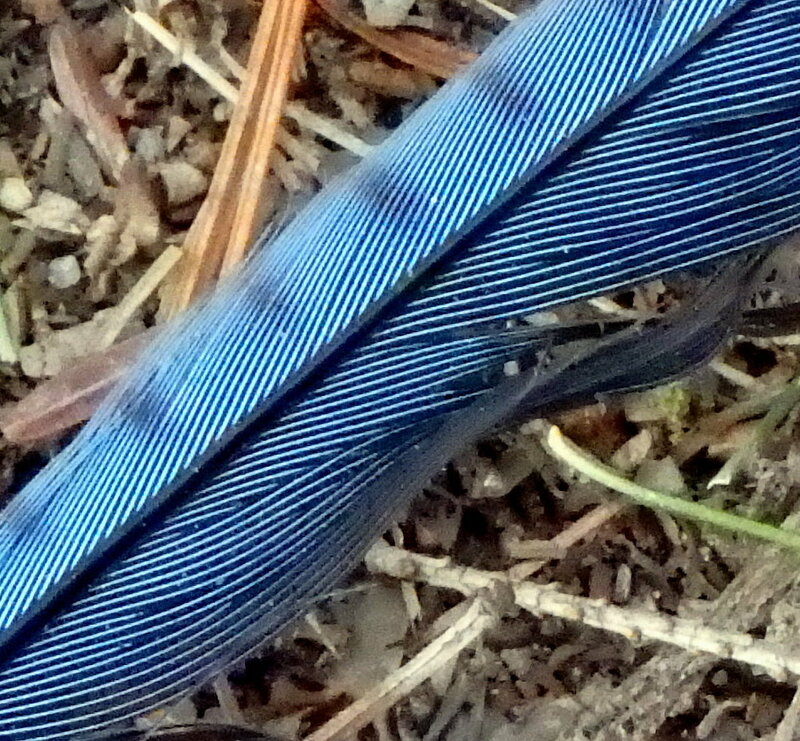 The blue of this blue jay feather rivaled that of the black raspberry cane. I don’t see many blue feathers so I was happy to see this one. I was even happier when I looked a little closer. 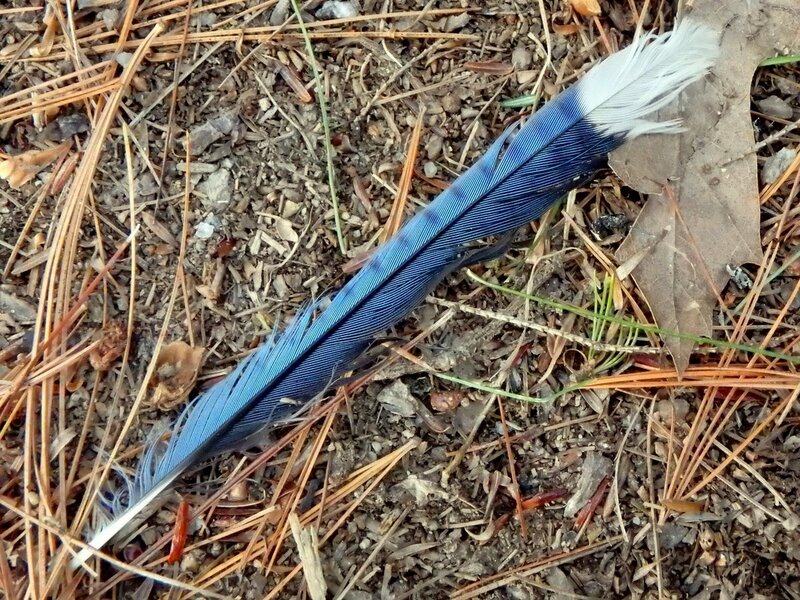 Seeing it up close revealed many things about blue jay feathers that I didn’t know. Chief among them was how very beautiful they are. 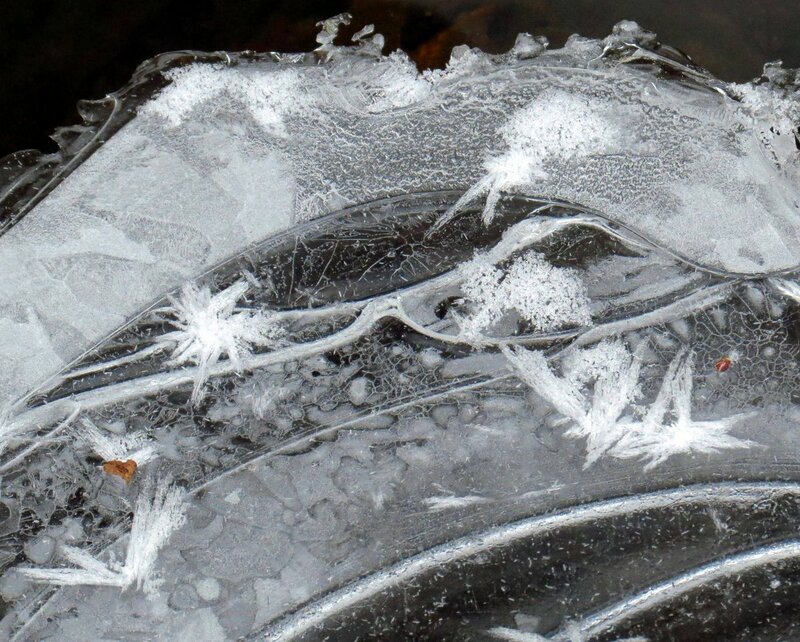 The old saying says that you should make lemonade when life gives you lemons, so when life gives me cold I take photos of the ice. 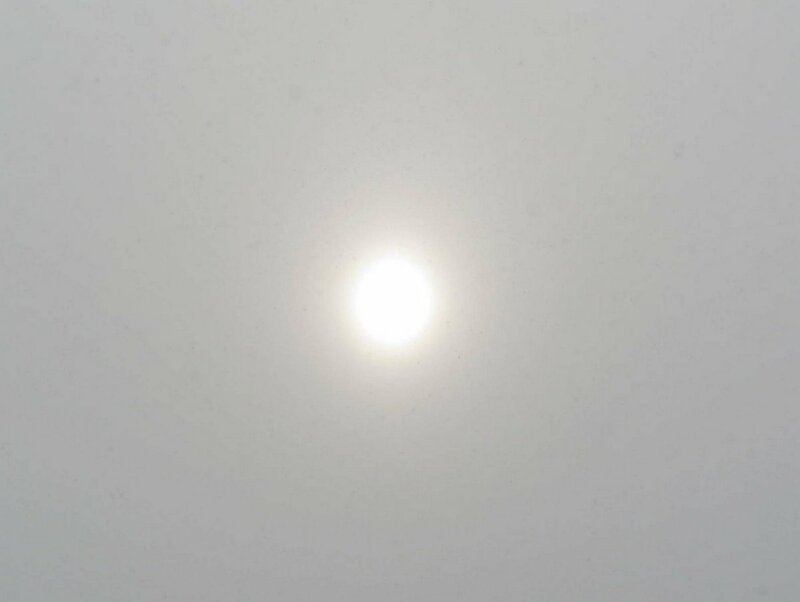 The one above shows what a little glimpse of sun on a cold, cloudy winter day looks like. There seems to be little real heat coming from it but I suppose if it wasn’t there we’d know what cold was really all about. 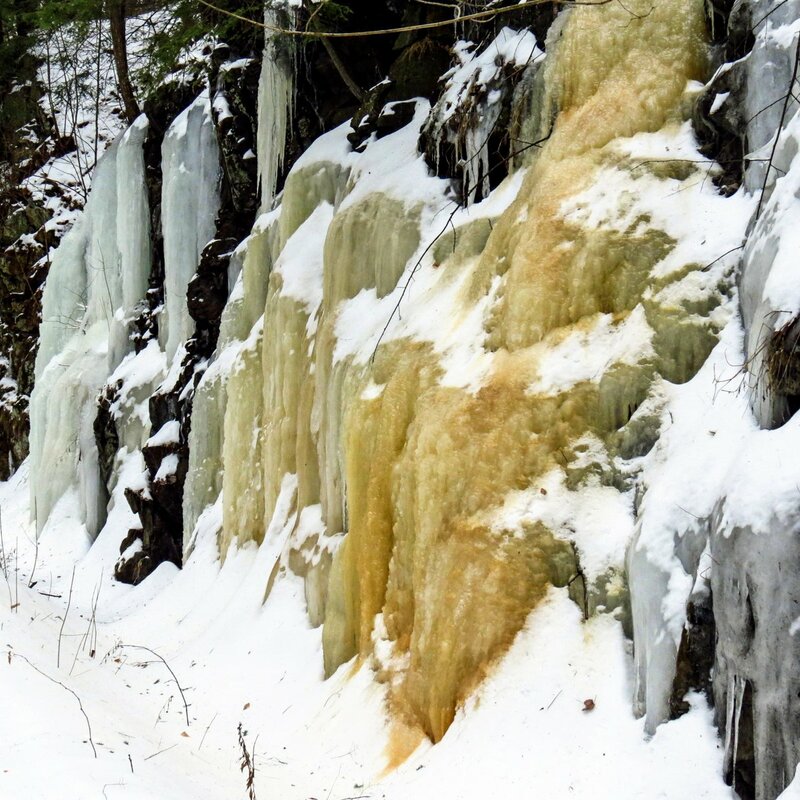 We’ve seen the temperature fall to as low as -12 °F (-24 °C) so far, and there’s a lot of January left. 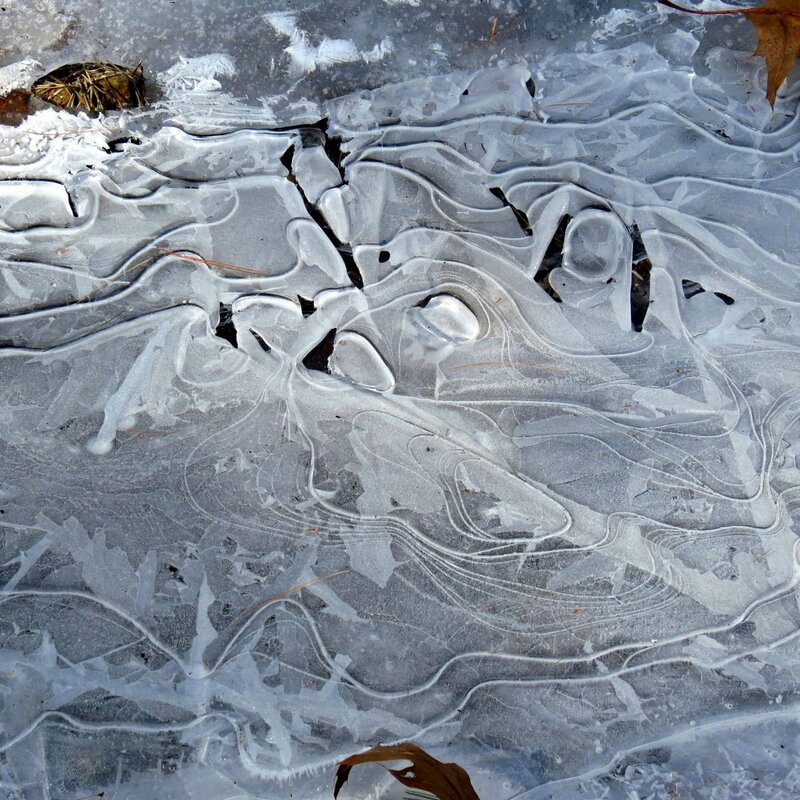 In the old house I grew up in the curtains would blow in the breeze even when the windows were closed and frost grew on the windows all winter long, so I grew up admiring all of the different shapes that can be seen in ice. They can be very beautiful and I still admire them. 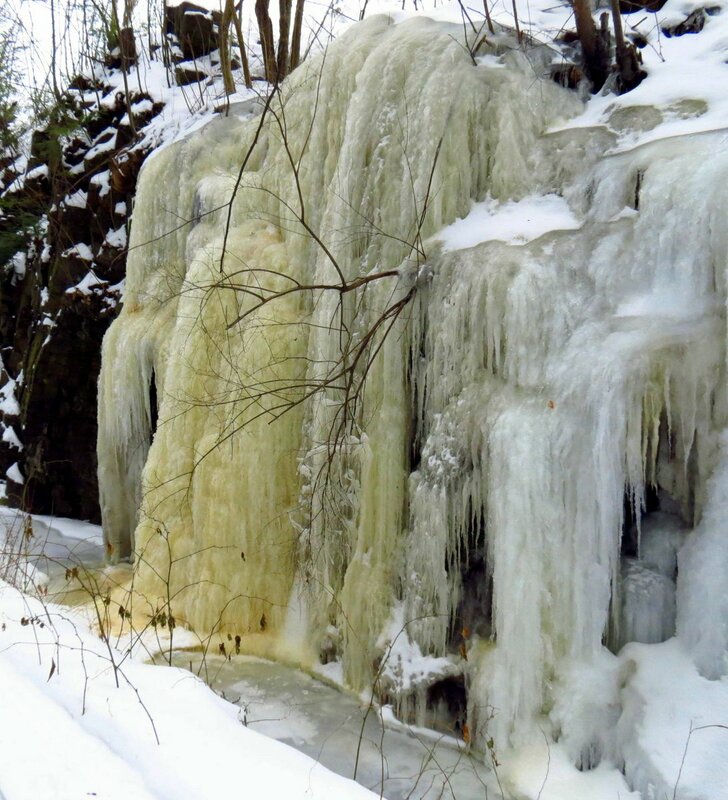 Fingers of ice suspended above the water of a stream revealed how much the water level had dropped since they formed. 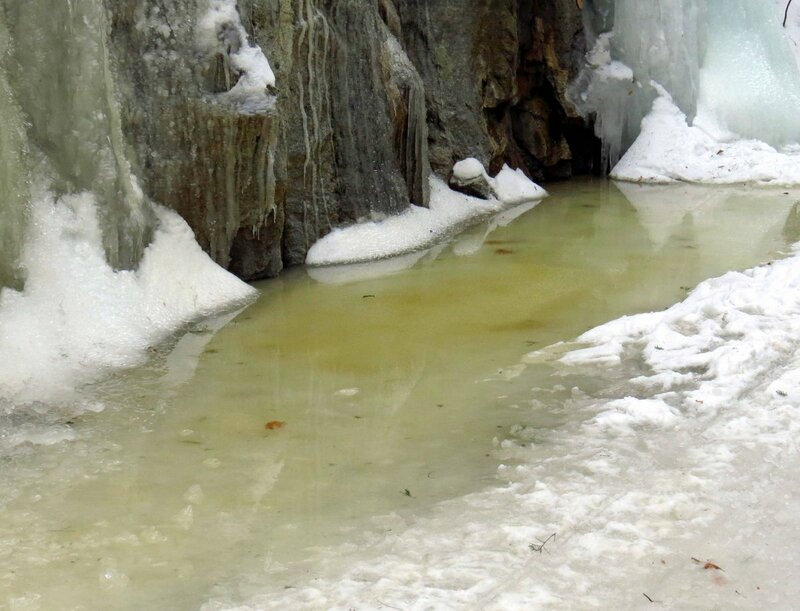 The same drop in water level can be seen along the river, but the ice here shows it in a different way. 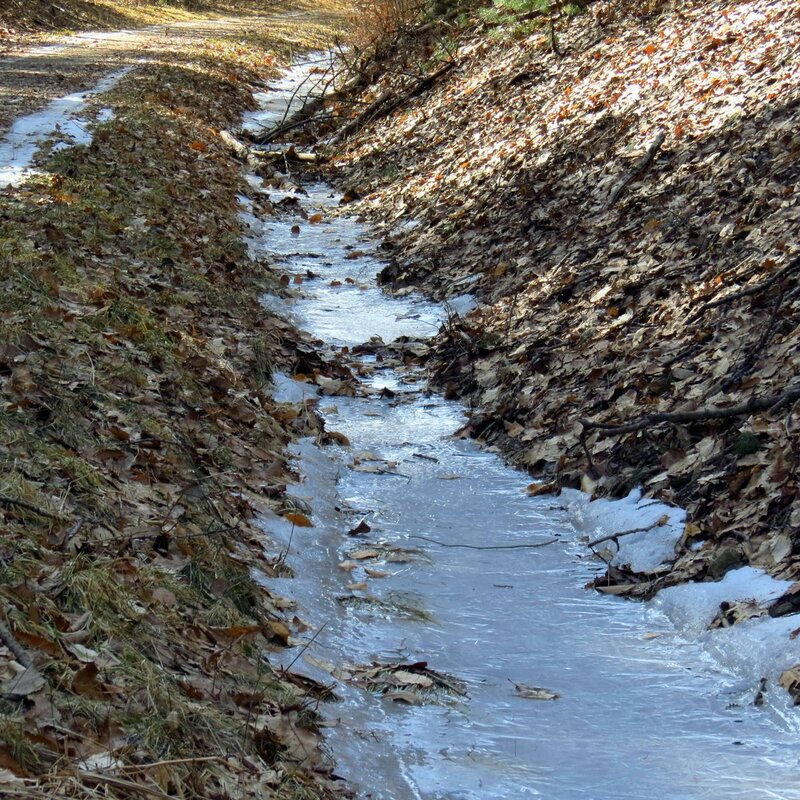 In rivers and streams ice always seems to start forming on the banks before working its way toward the middle but on lakes and ponds it is just the opposite; it starts forming in the middle and works its way towards shore. 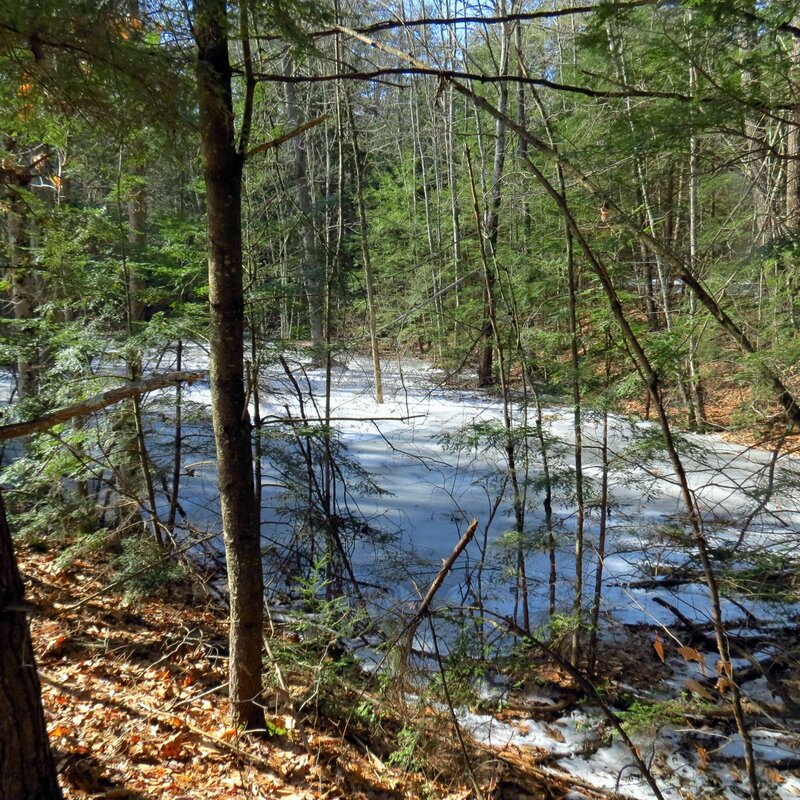 I’m sure that the movement of the water in rivers and streams has a lot to do with it, but there must be more to it than that. Last winter the river rose higher than I’ve ever seen it in this spot due to down river ice jams blocking the flow, and thick ice covered everything that can be seen in this photo. 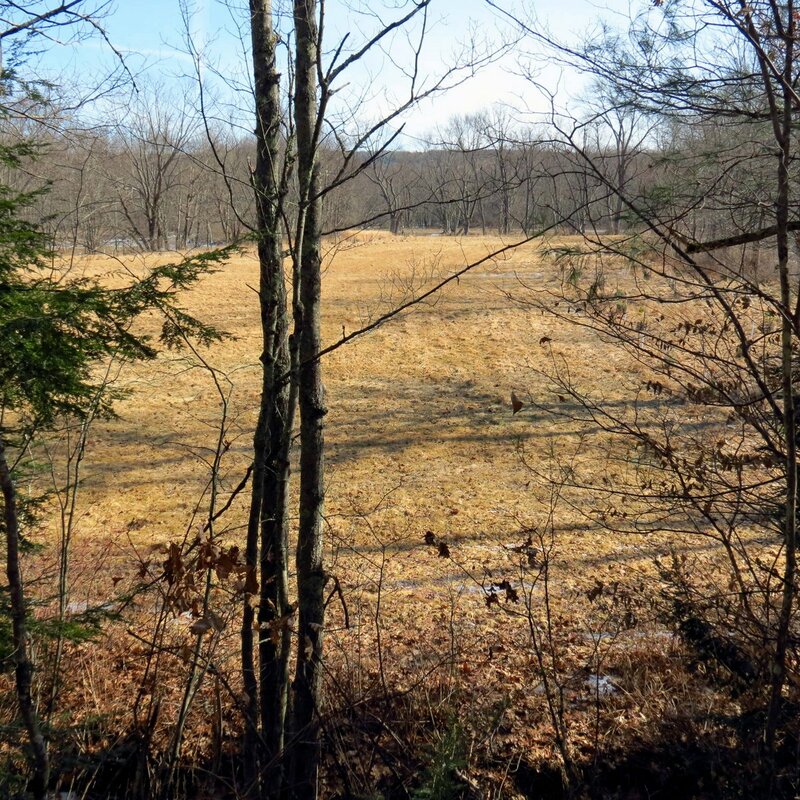 It was like an ice covered wasteland and you couldn’t tell where the land stopped and the water started. 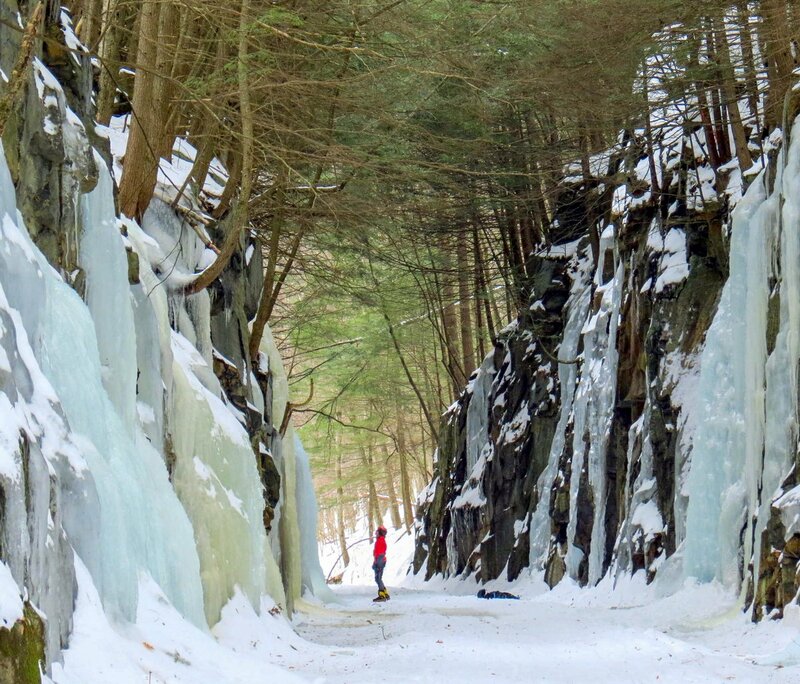 Best to stay off that kind of ice. 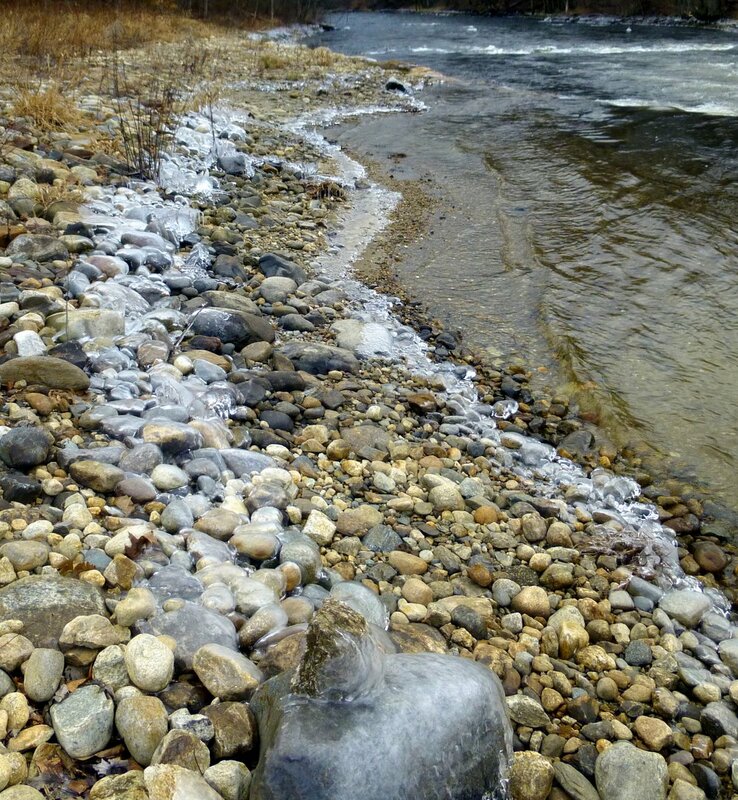 I thought it was strange that all of the larger stones along the river were coated with ice but the smaller stones weren’t. 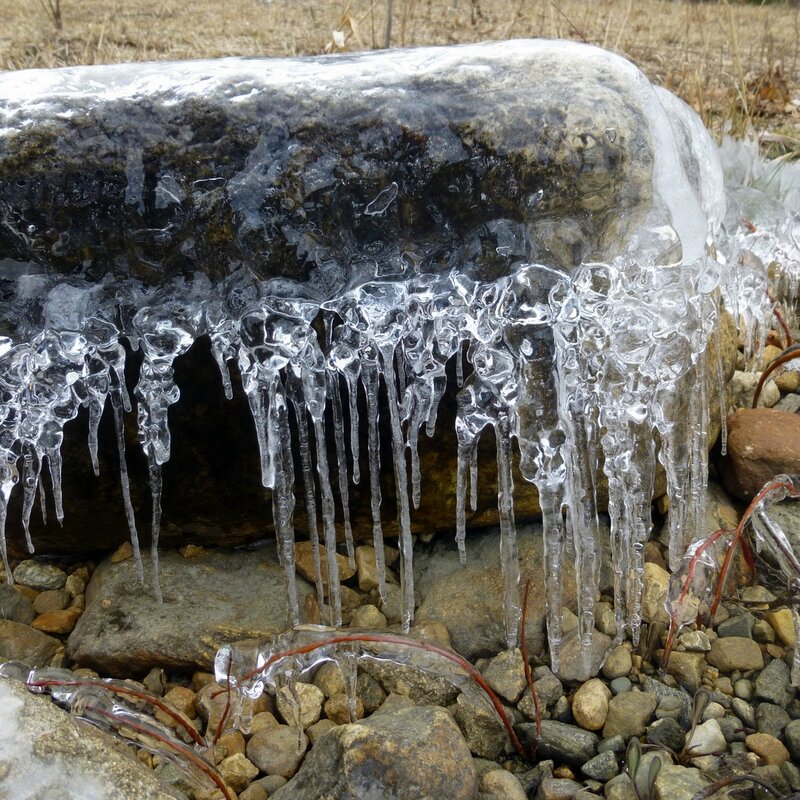 I would have guessed that it would be the reverse, because it seems like the larger stones would absorb and hold more heat from the sun and keep the water from freezing. 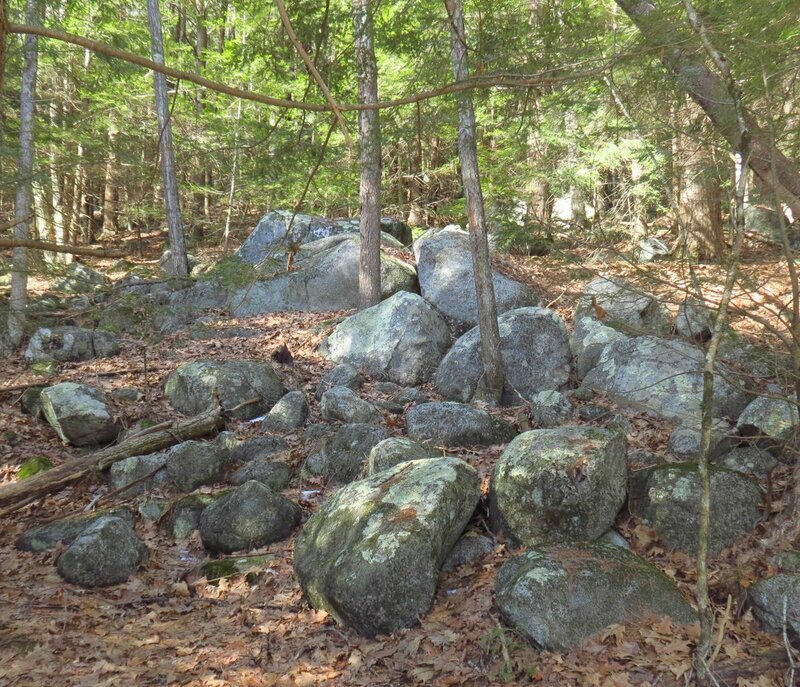 Could it be that the larger stones take longer than the smaller ones to absorb that heat? 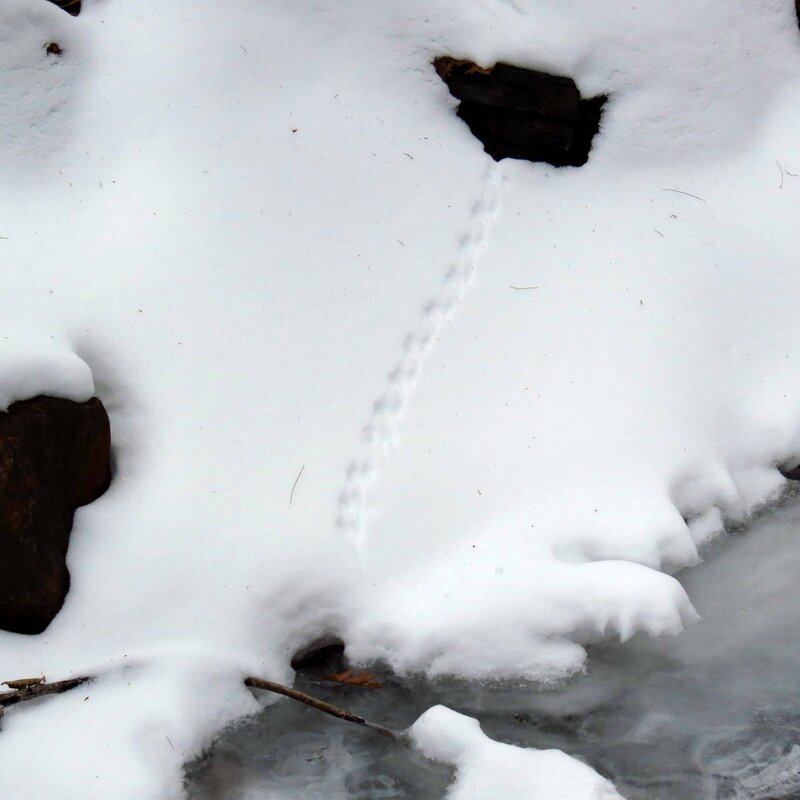 Just another of nature’s mysteries to add to an ever growing list. 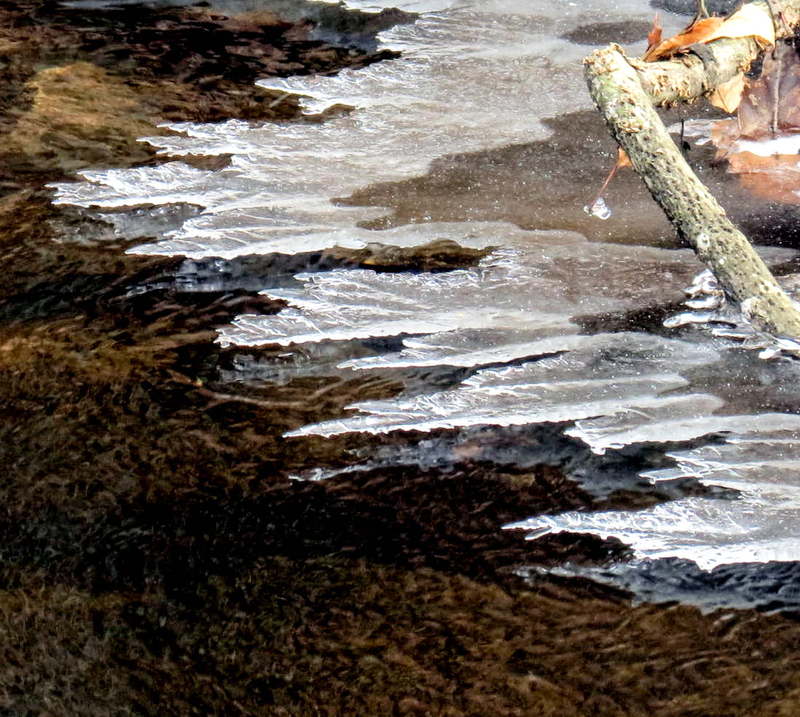 Along another small stream I saw more ice needles than I’ve ever seen in one place. 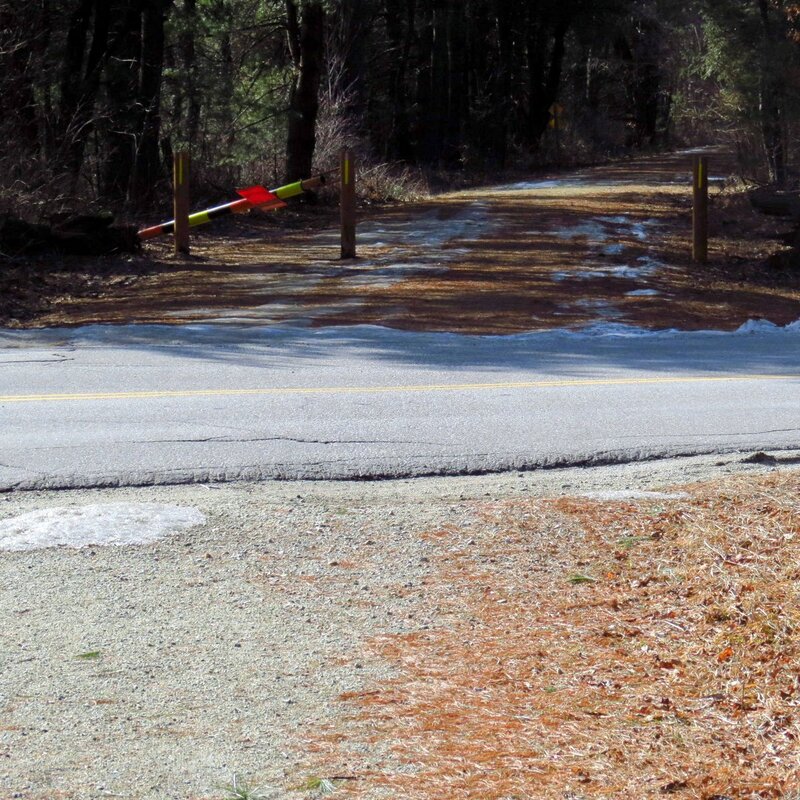 There were many millions of them growing out of the gravel, all along its banks. 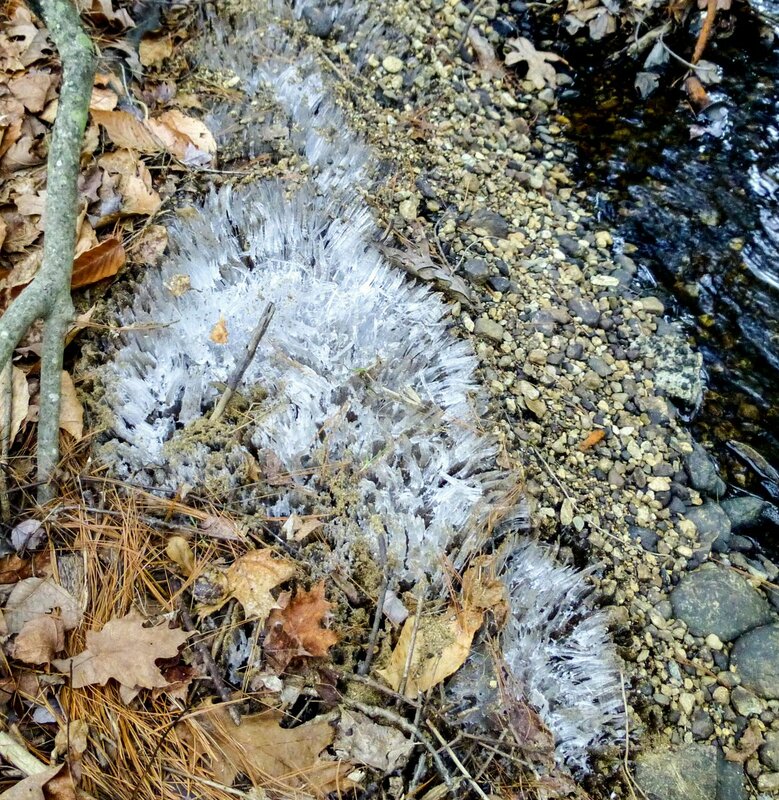 Usually I see ice needles that are coated with the soil that they grow out of but these were surprisingly clean because of the gravel. 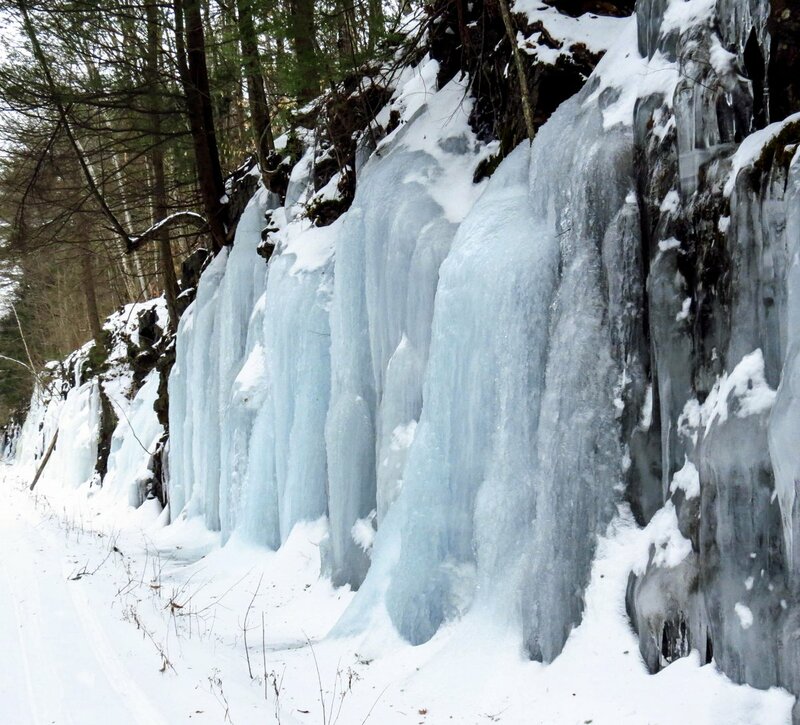 They were also the longest ice needles that I’ve seen. Many were 6-8 inches long. 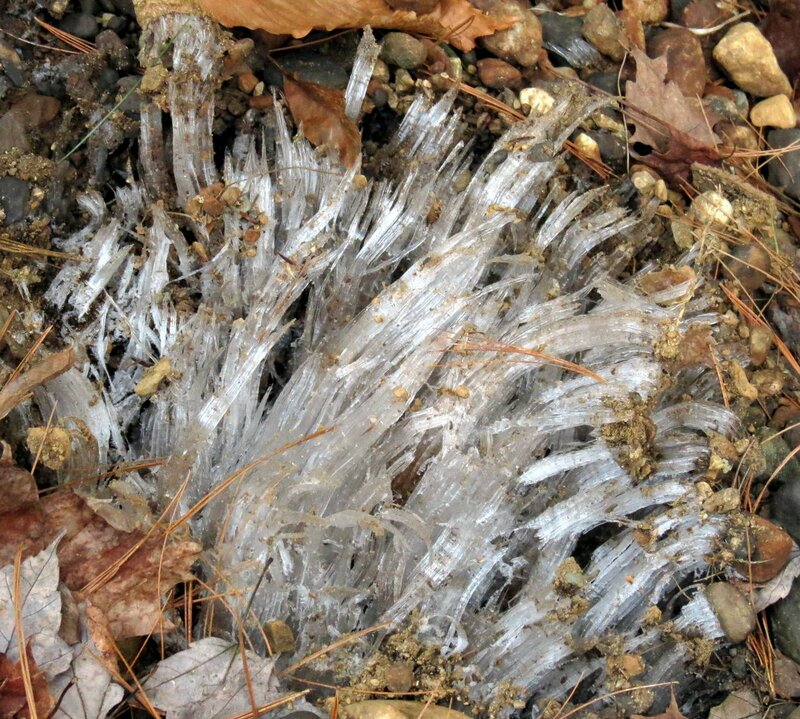 When the air temperature is below 32 degrees Fahrenheit right at the soil surface and the soil and groundwater remain thawed, hydrostatic pressure can force the groundwater, sometimes super cooled, out of the soil where it freezes instantly into a “needle.” As more water is forced out of the soil the process is repeated over and over, and each needle grows in length because of more water freezing at its base. 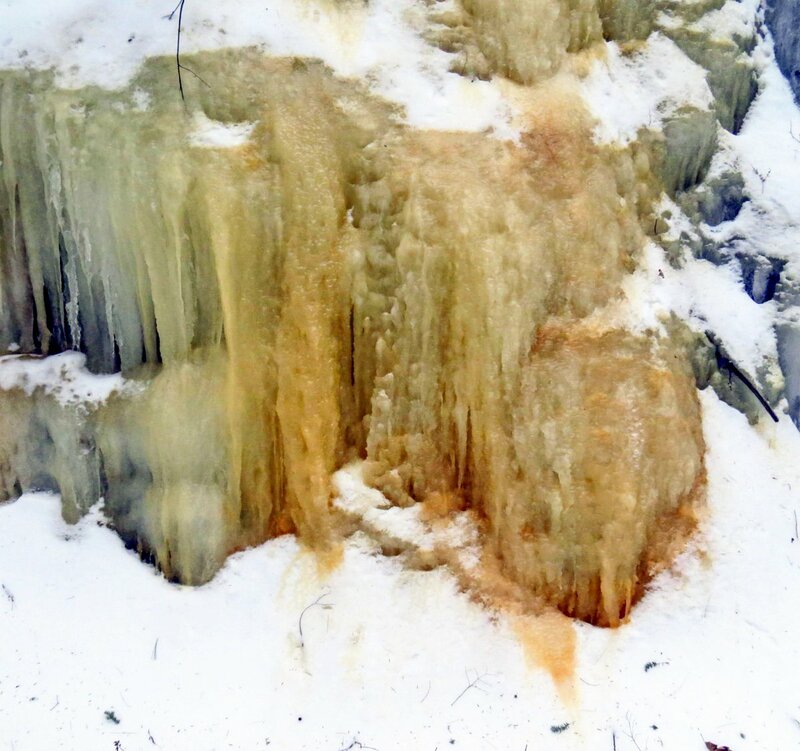 From what I’ve seen the needles almost always freeze together and form ribbons like those seen in the above photo. 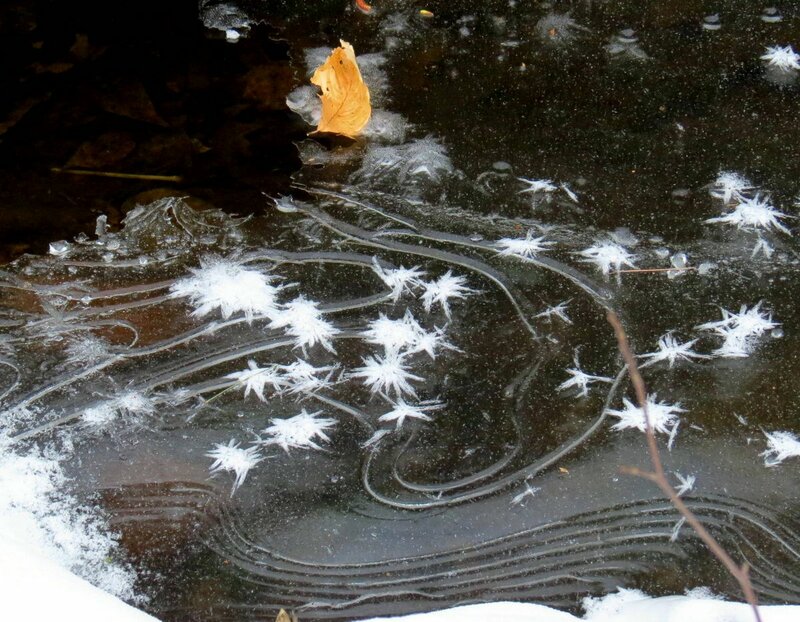 Ice needles are very fragile, as you can imagine. 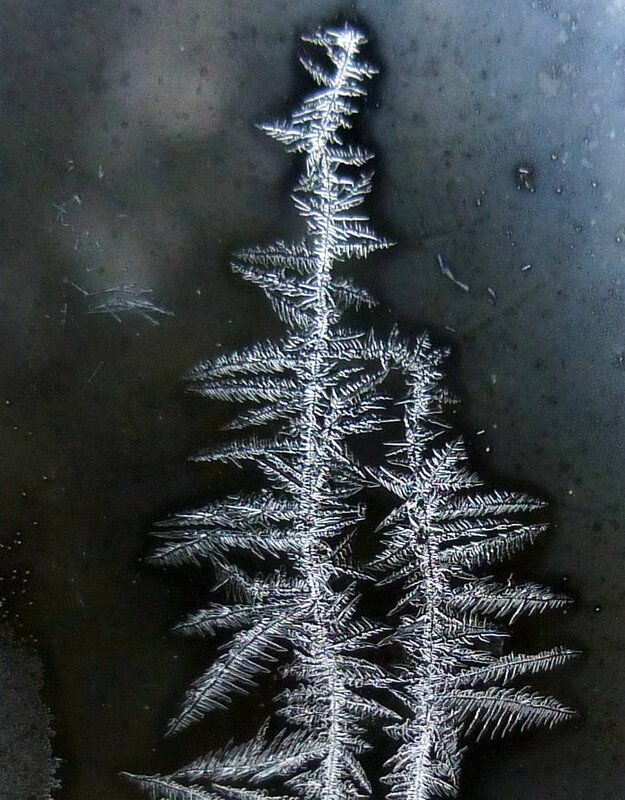 I wanted to move a leaf so I could get a better shot of some needles but when I moved it the needles went with it. 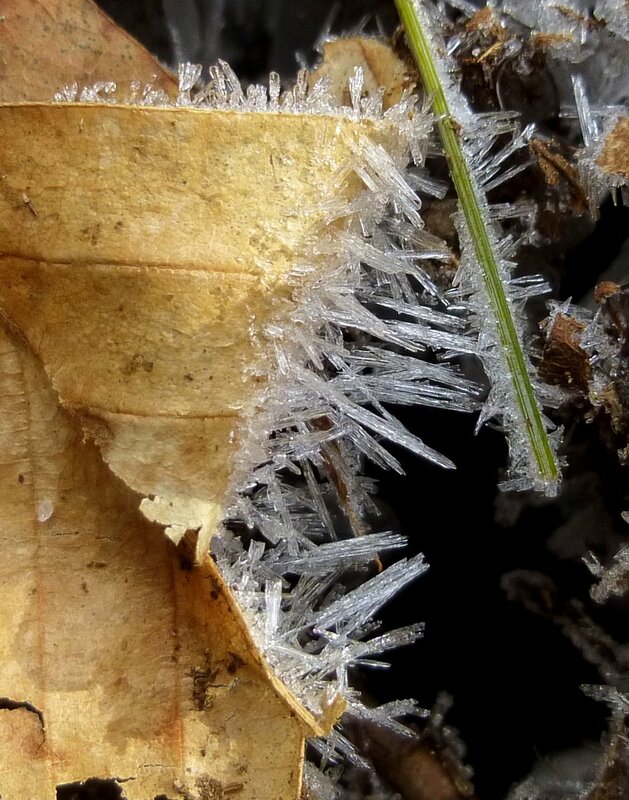 You can see how they’ve attached to the underside of the leaf along with some hoar frost that has grown there. 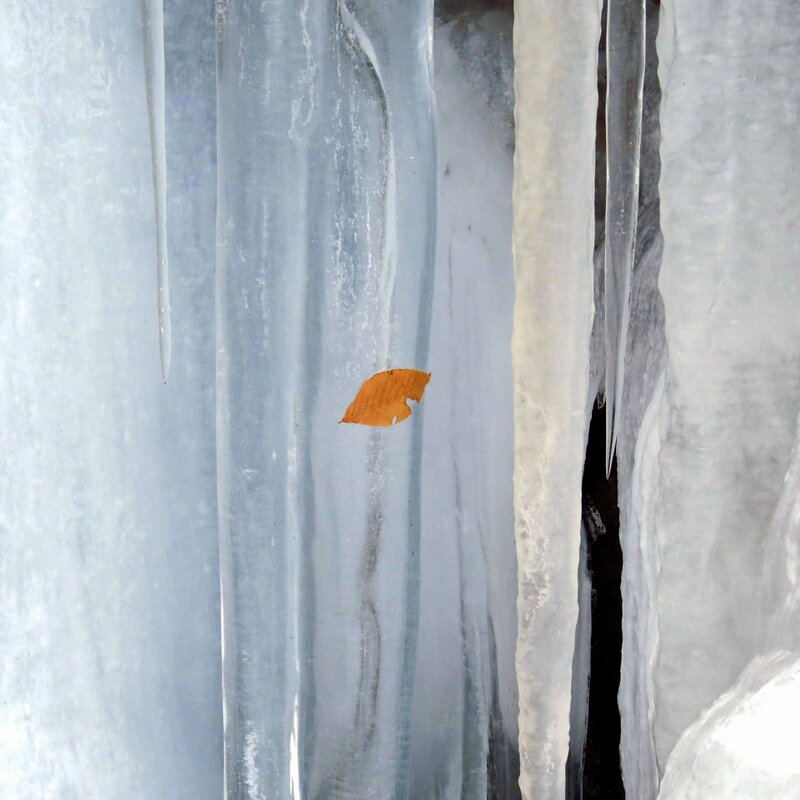 I was surprised to find that ice ribbons weigh next to nothing-little more than the dry leaf they were hanging from, so it must take very little water to make them. 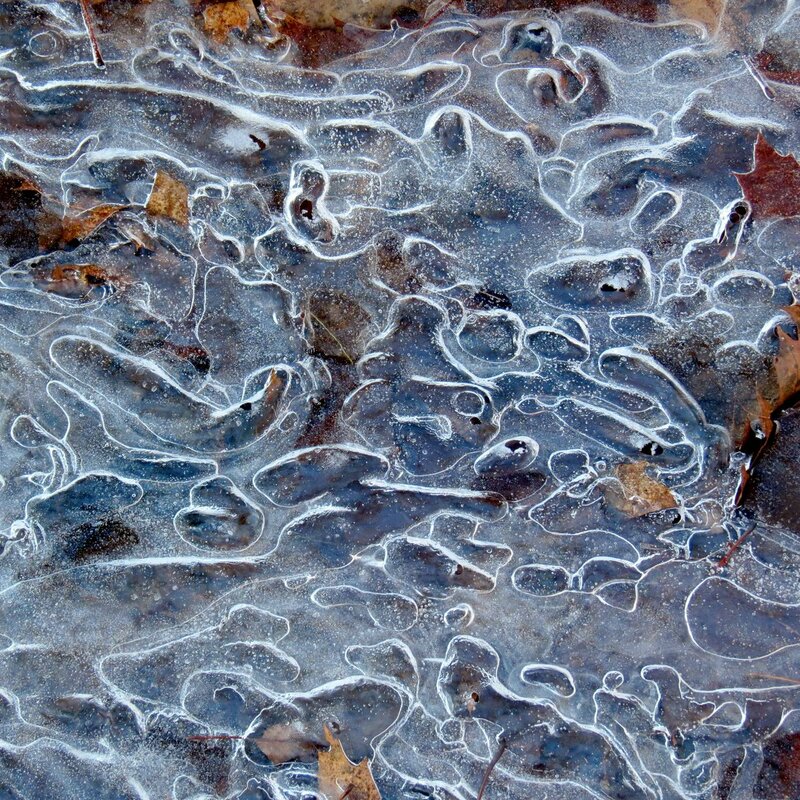 The whiter the ice, the more air bubbles were trapped in it when it froze. That explains the color, but what explains the long, needle like crystals and the strange pinging noise it makes when it breaks? There might be answers to those questions out there, but I haven’t been able to find them. 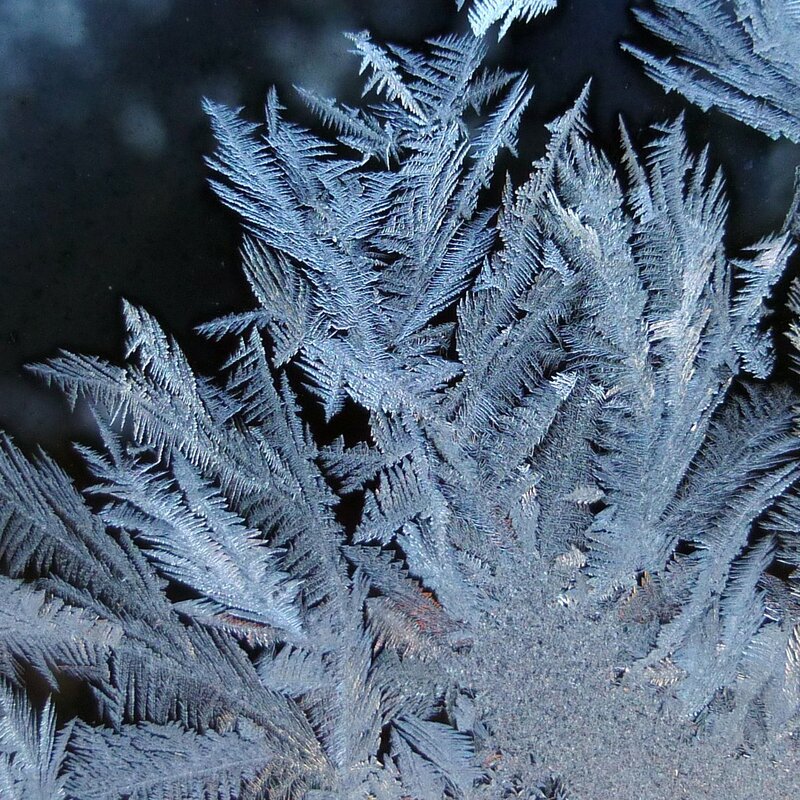 Hoarfrost grows whenever it’s cold and there is a source of water vapor nearby. 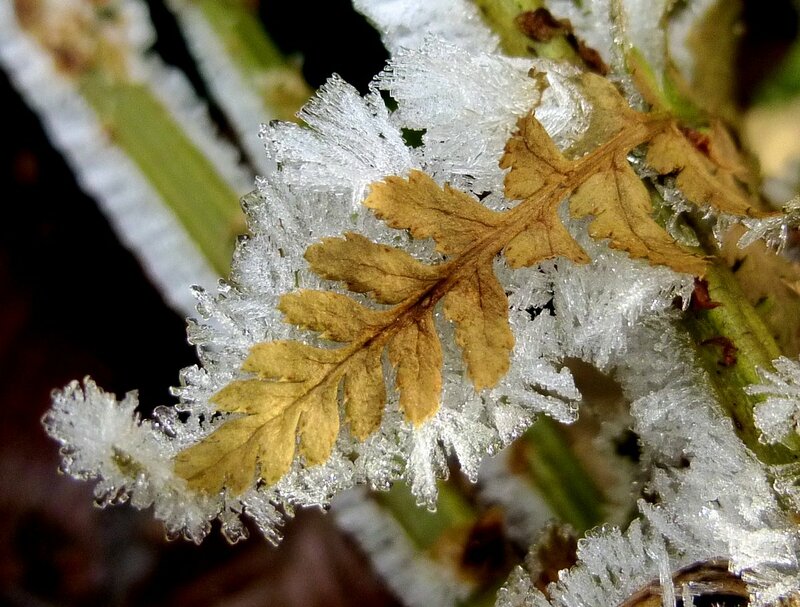 When it is below freezing the water vapor from unfrozen rivers and streams often condenses on the plants all along their banks and covers them in hoarfrost, as this fern leaf shows. 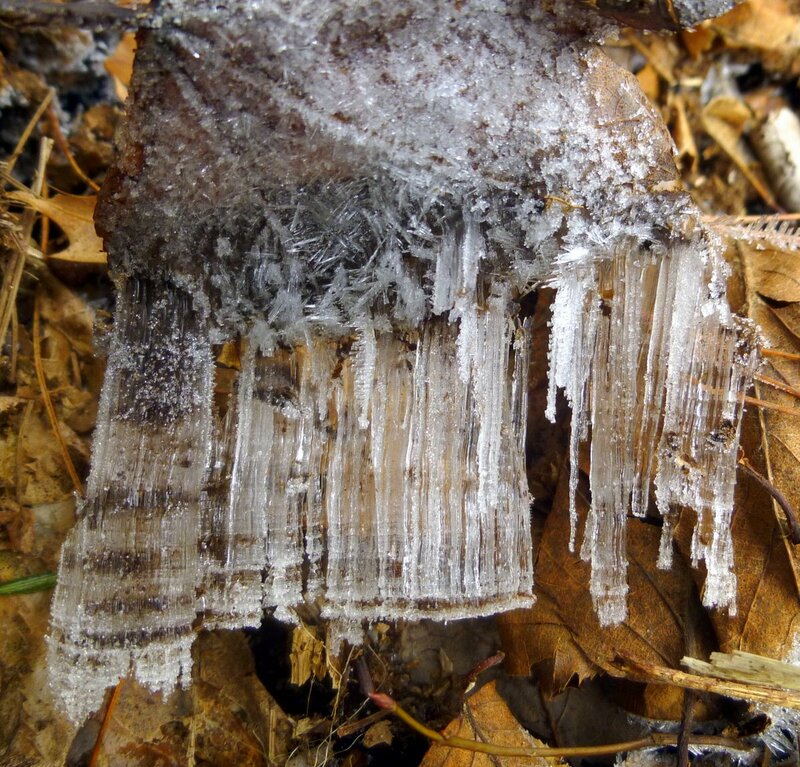 More examples of hoarfrost. It looks so very delicate that I often have to remind myself to breathe while I’m taking its photo. One touch of a warm finger, a ray of sunshine, or a warm breath and they’re gone. 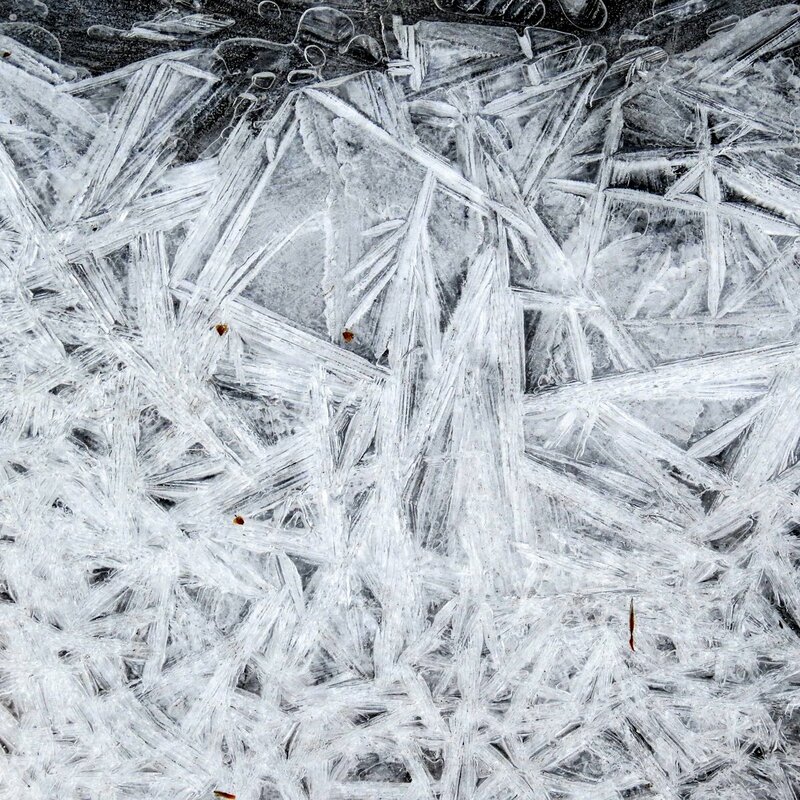 Ice can be very abstract. 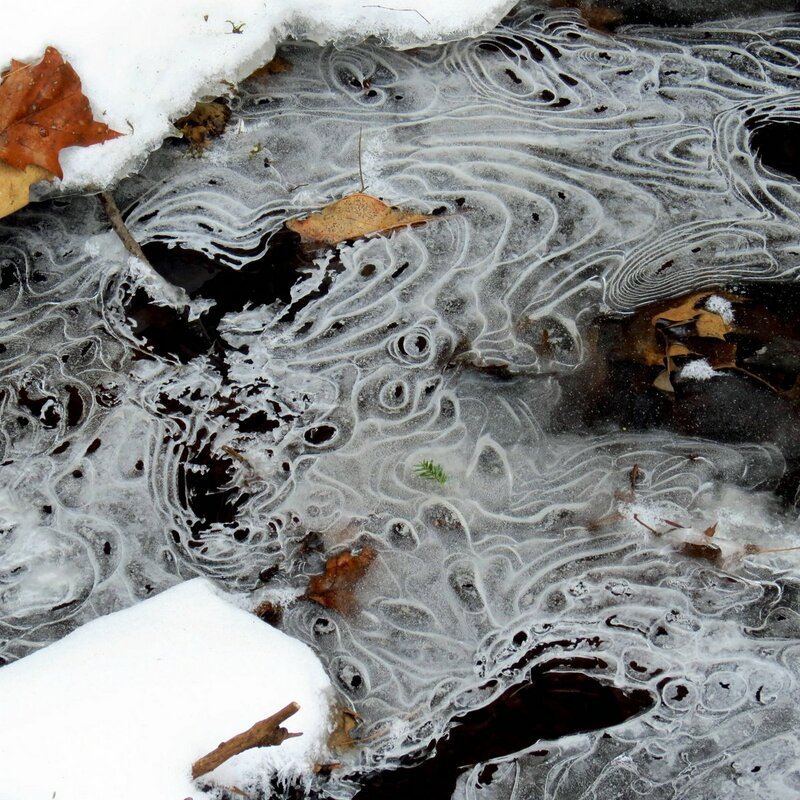 This streamside example had a lot of large bubbles frozen in place and it showed a surprising amount of depth as well as abstraction and it reminded me of the old black and white Twilight Zone TV episodes from the 60s. 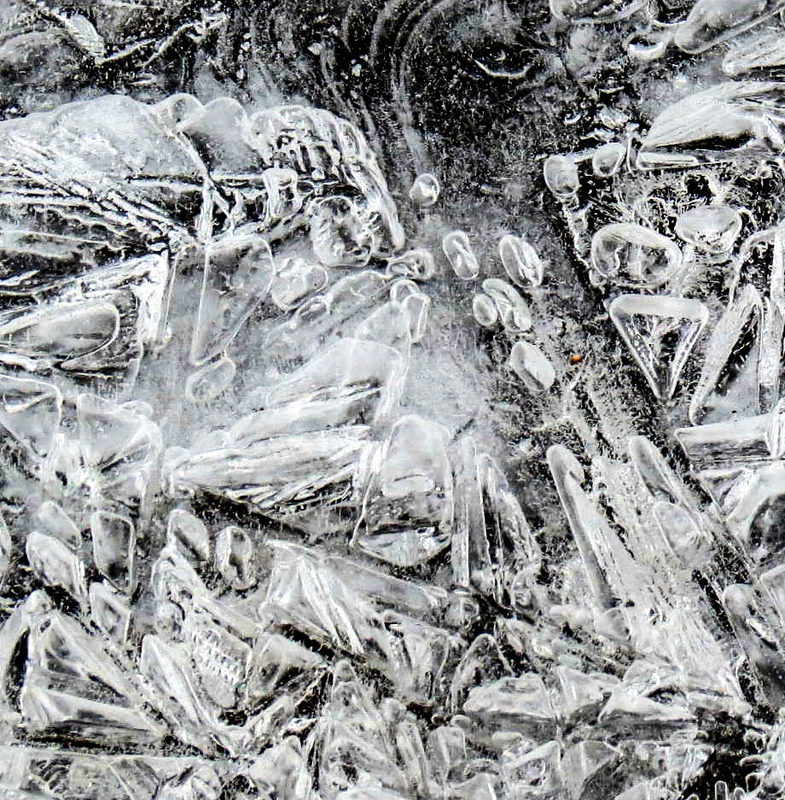 I can see an eye and a set of teeth and a flying bird and a fish skeleton and several other things in it so you see, ice can even give us the imagination of a child again, at least for a little while. I can’t think of many gifts greater than that one. 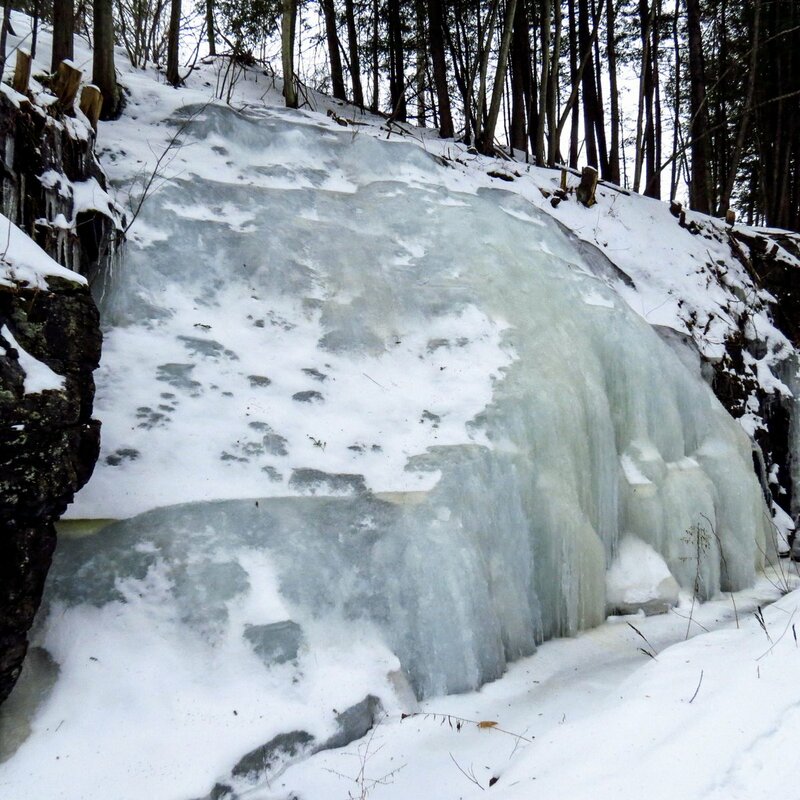 Ice can also reveal the hidden groundwater that seems to seep out of the soil year round but is nearly impossible to detect until it freezes. 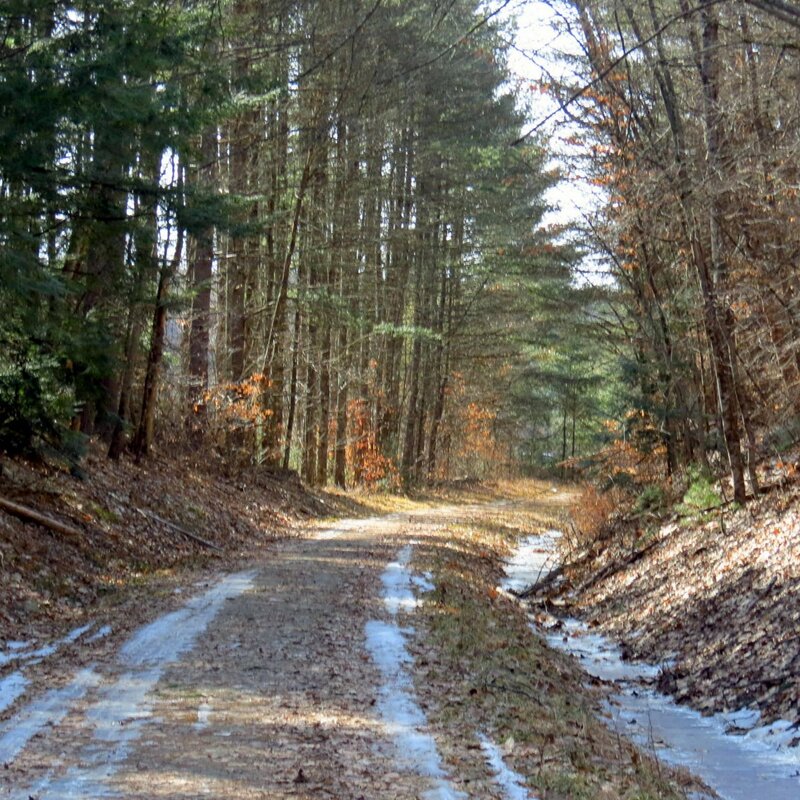 Once winter shows us where it is if we can remember to return to the spot in the summer we might find some interesting plants there. 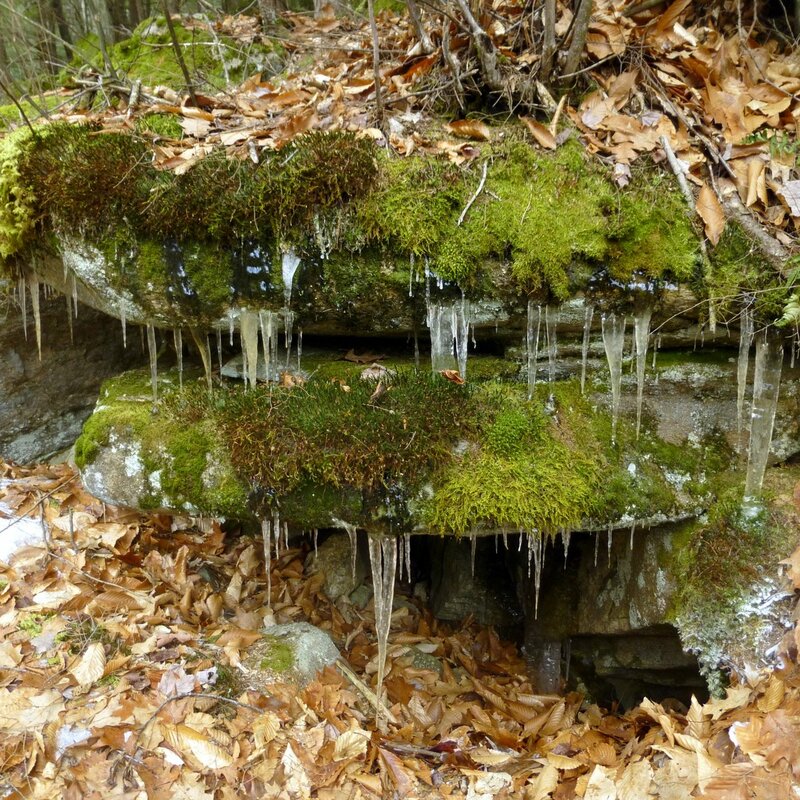 Some orchids, certain liverworts, and other fascinating plants like to grow where water constantly seeps. In this spot the liverwort known as greater whipwort (Bazzania trilobata) grows in abundance. 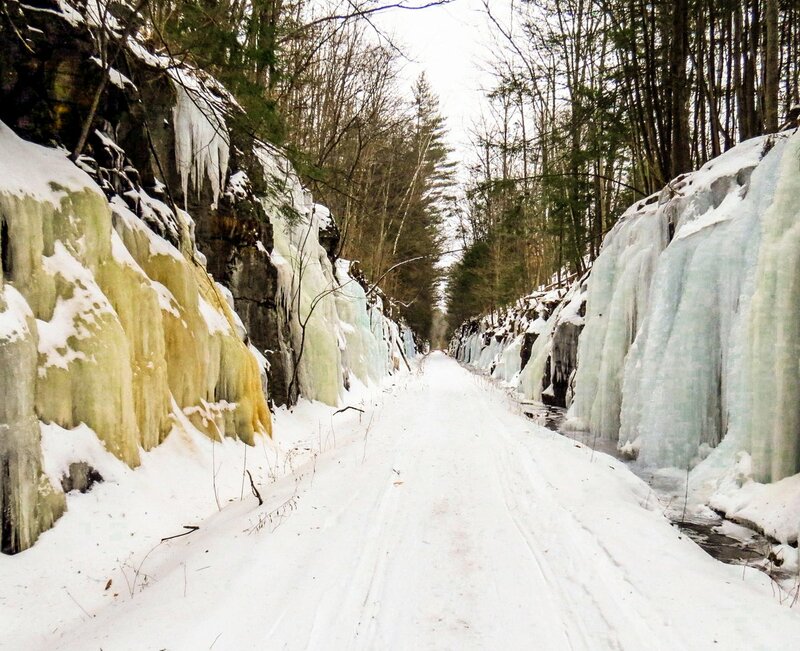 In this photo the ice seems to be letting us see into the future. 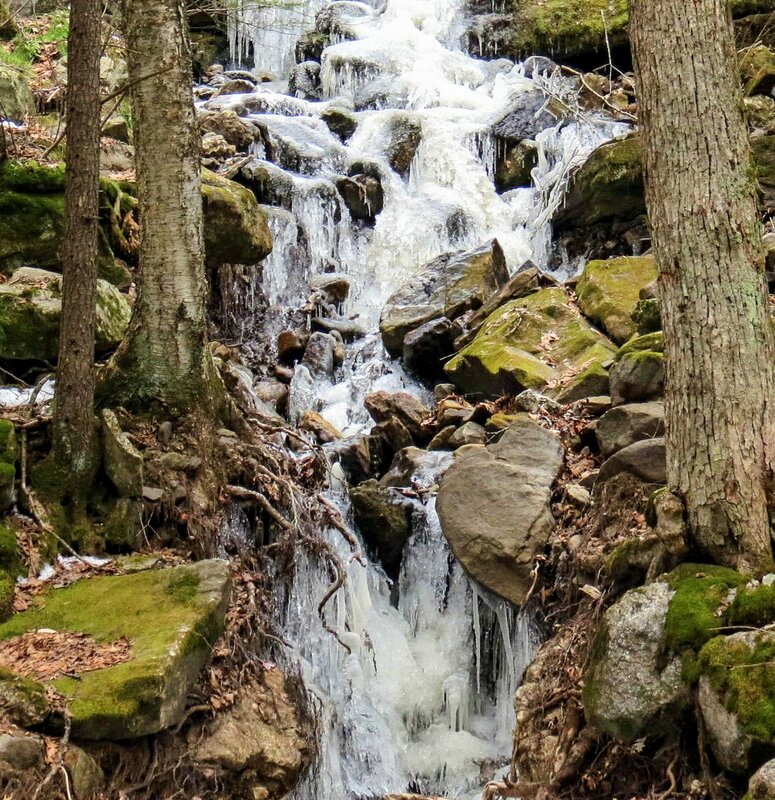 I can see a couple of large boulders and even a tree or two being toppled by this stream before too long. 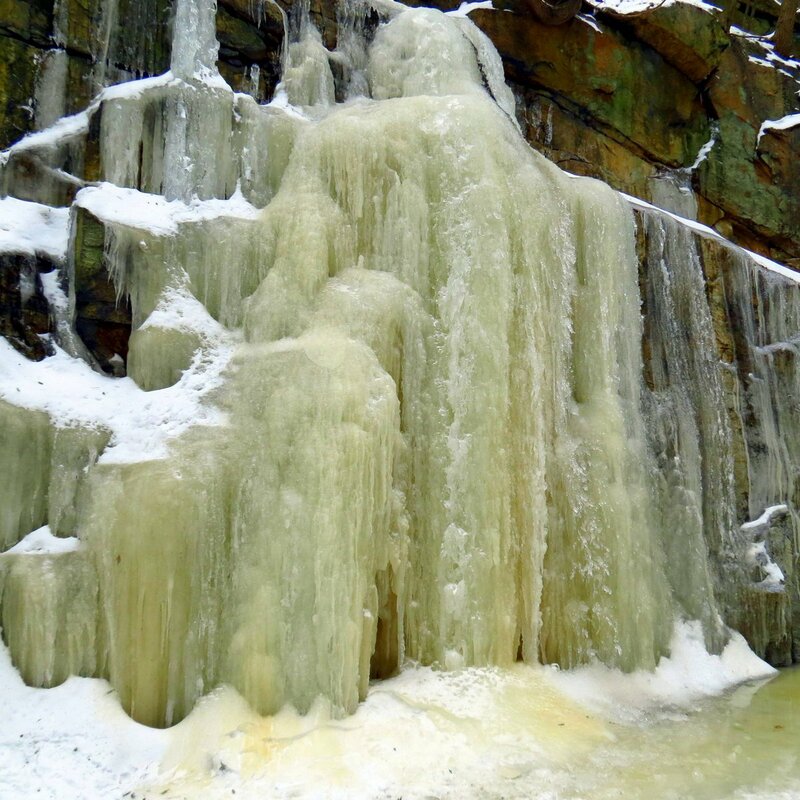 Of course because of the way ice expands it might set things to tumbling before it even has a chance to melt.